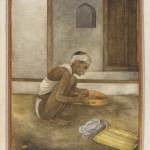 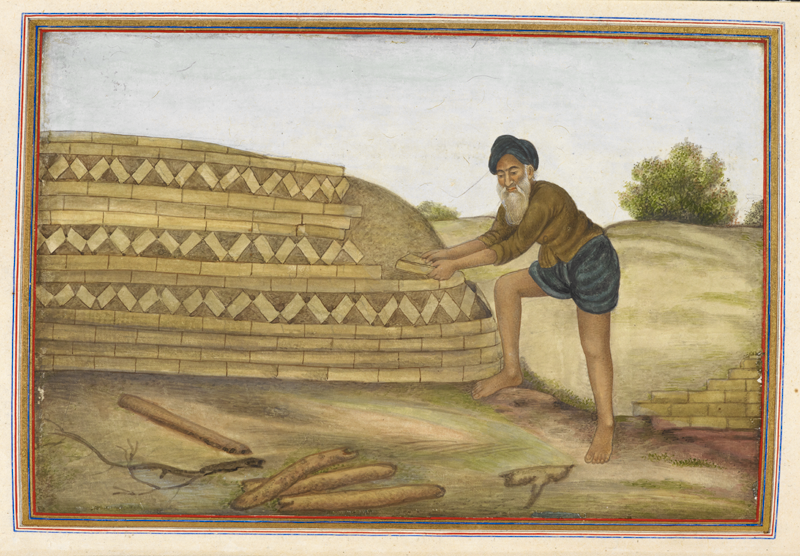 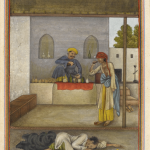 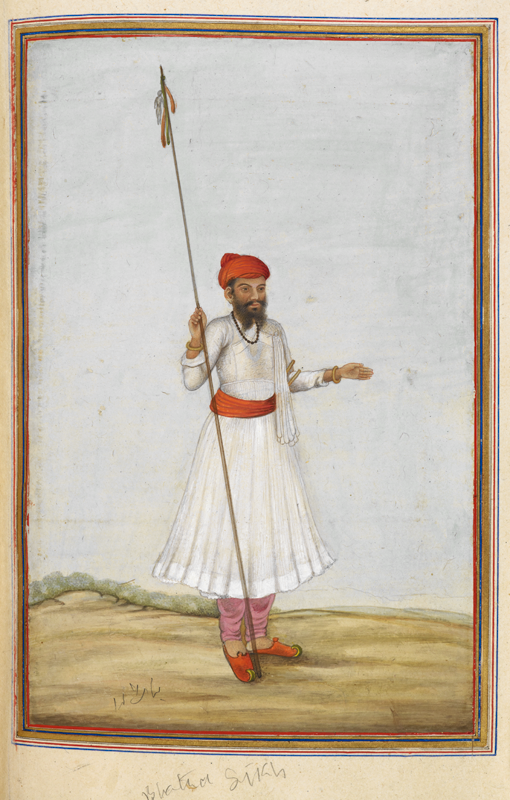 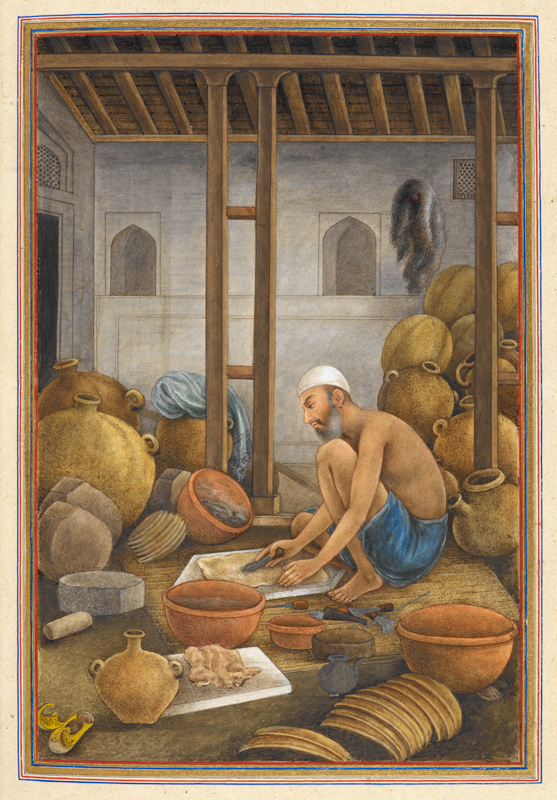 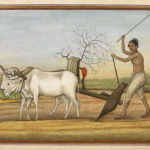 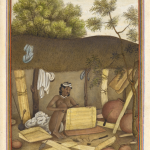 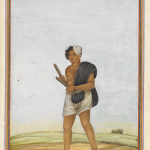 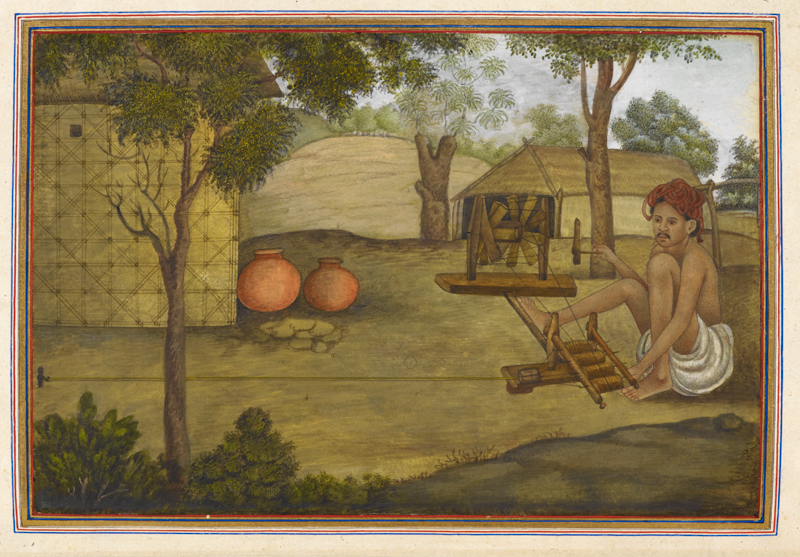 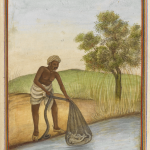 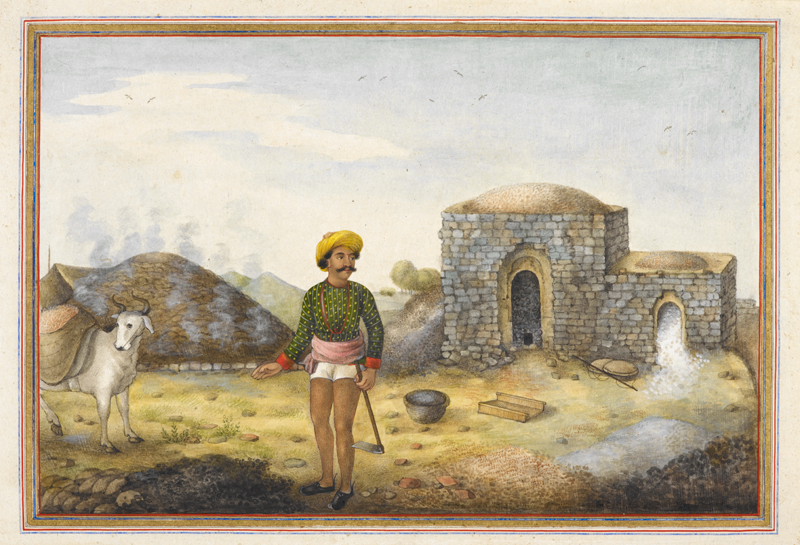 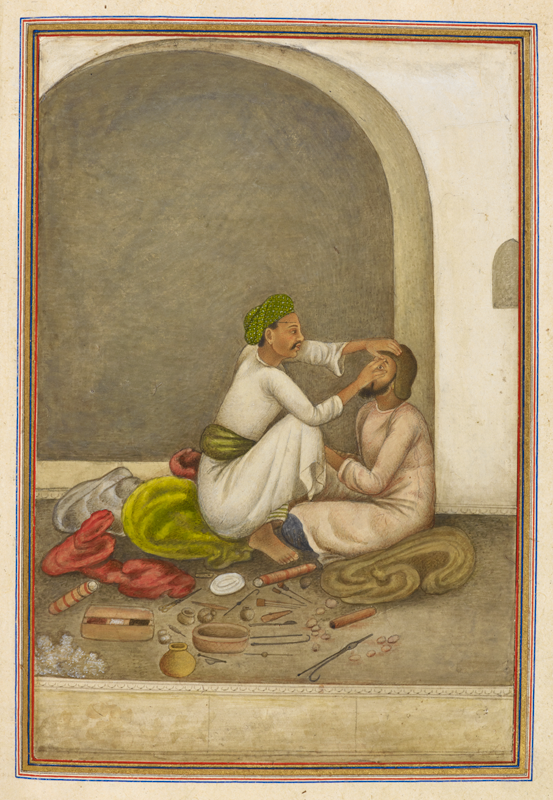 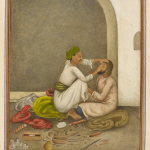 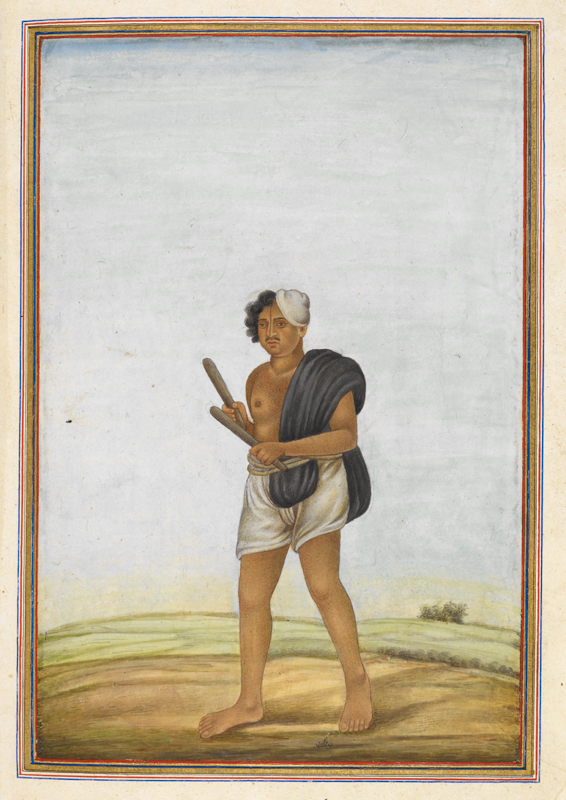 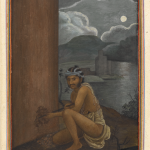 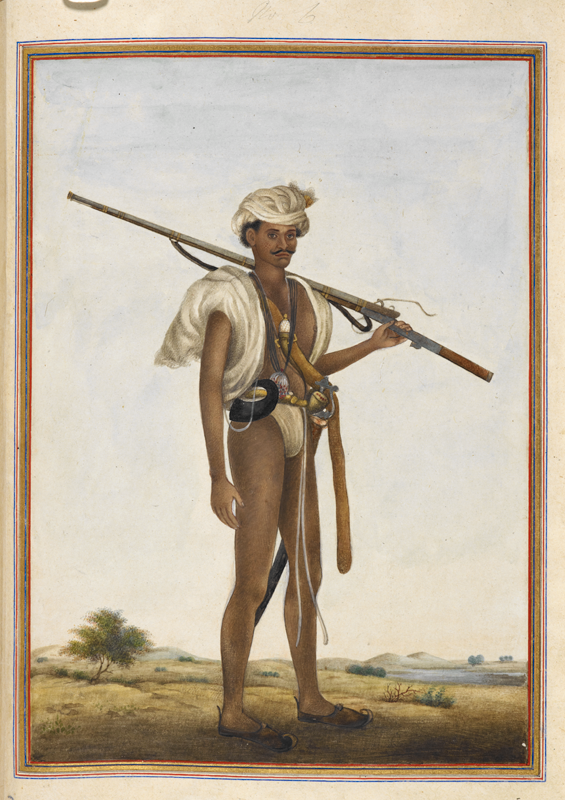 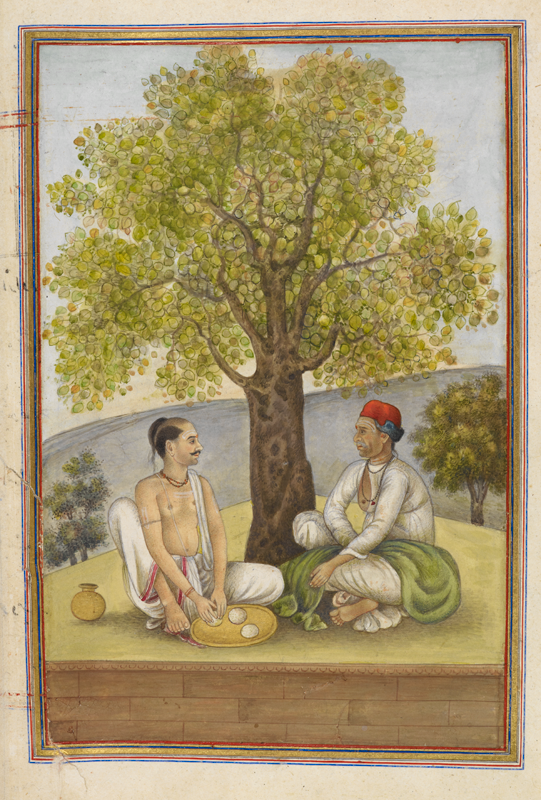 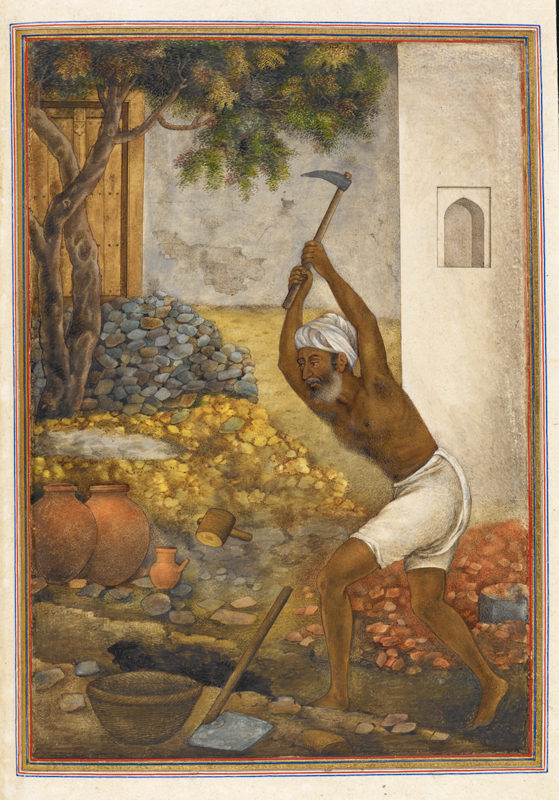 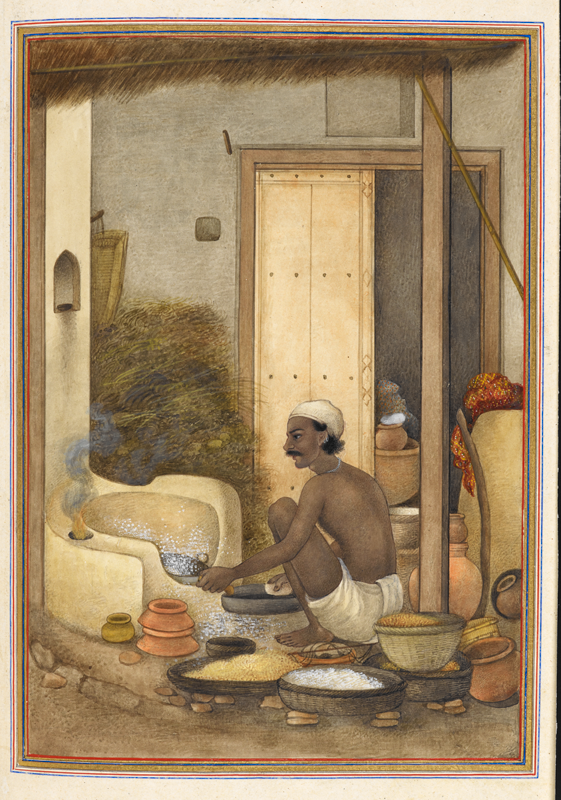 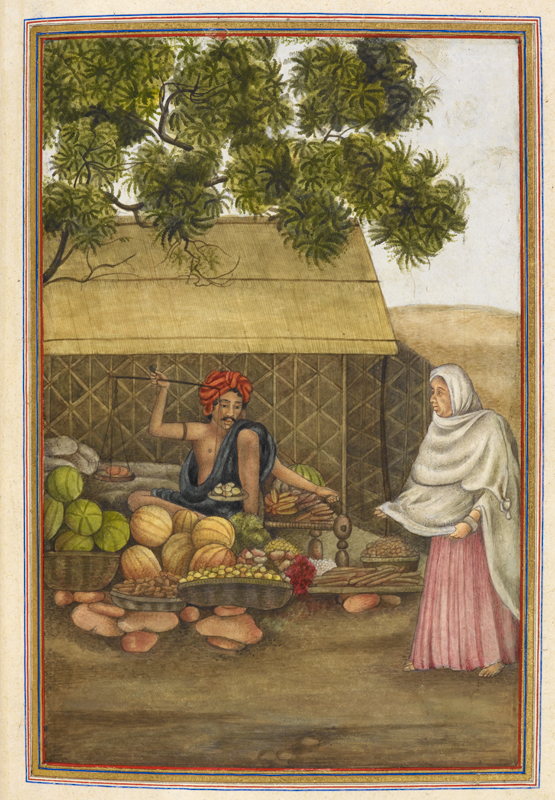 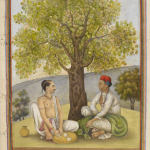 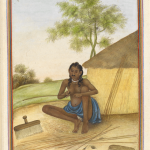 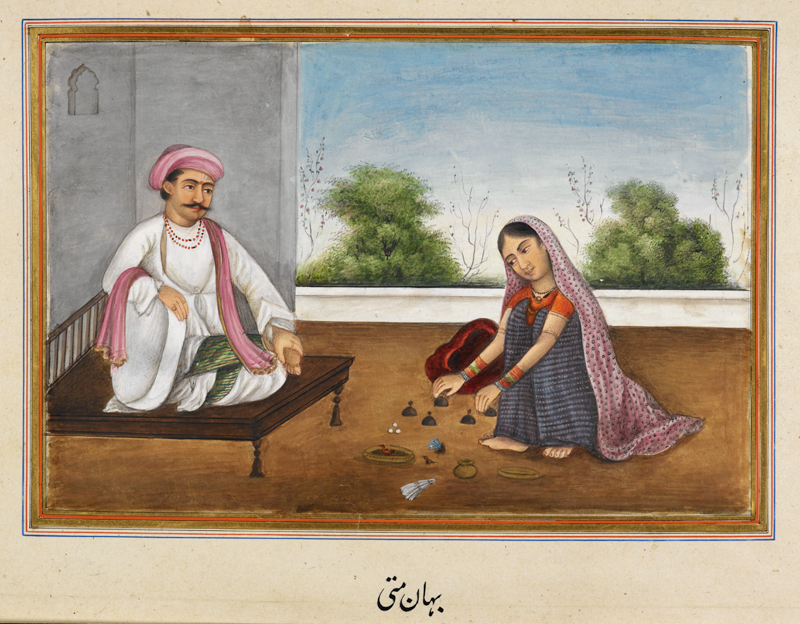 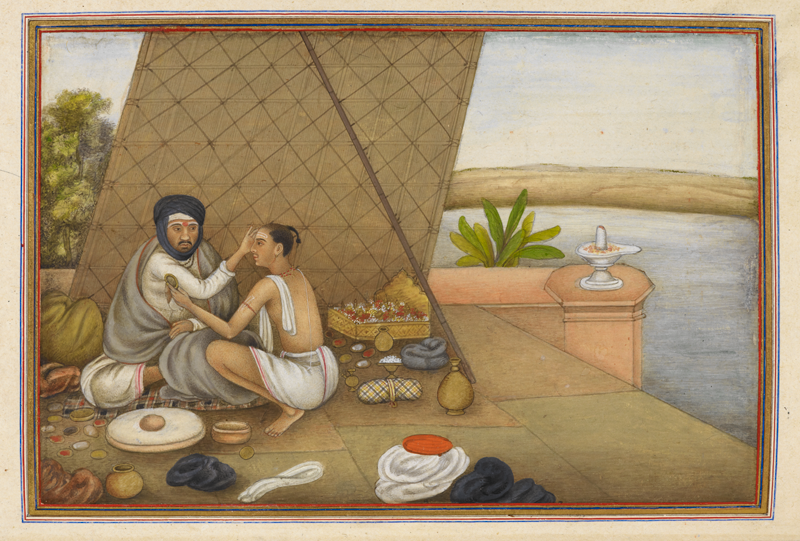 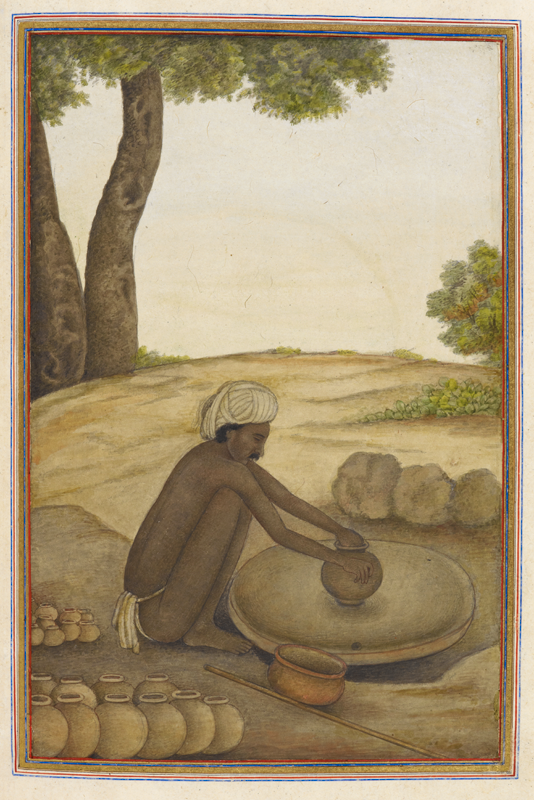 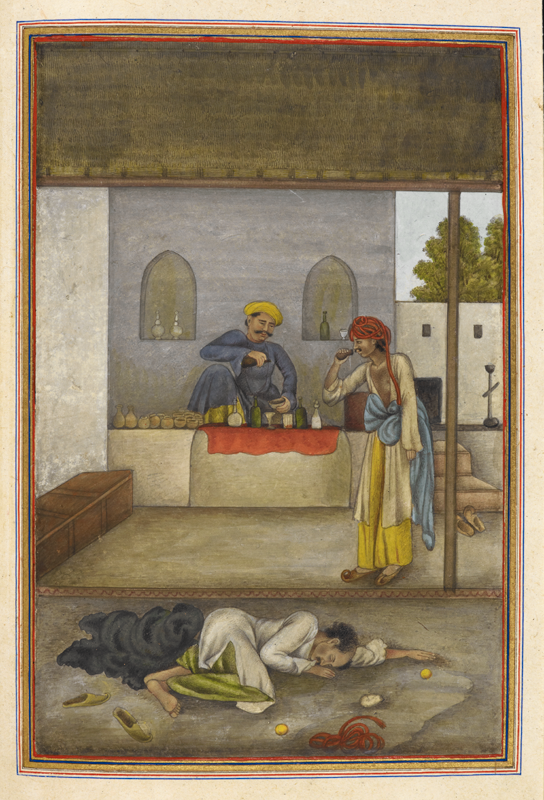 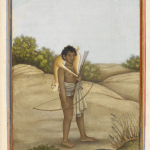 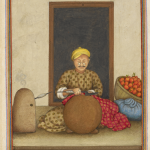 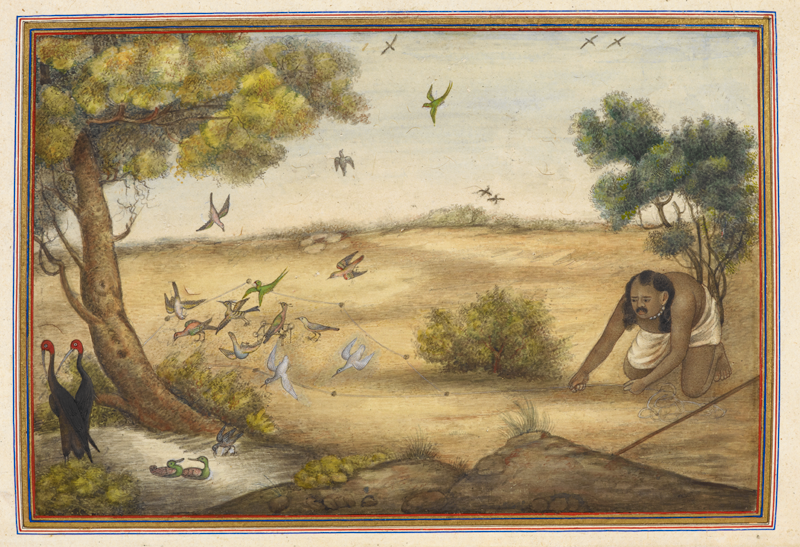 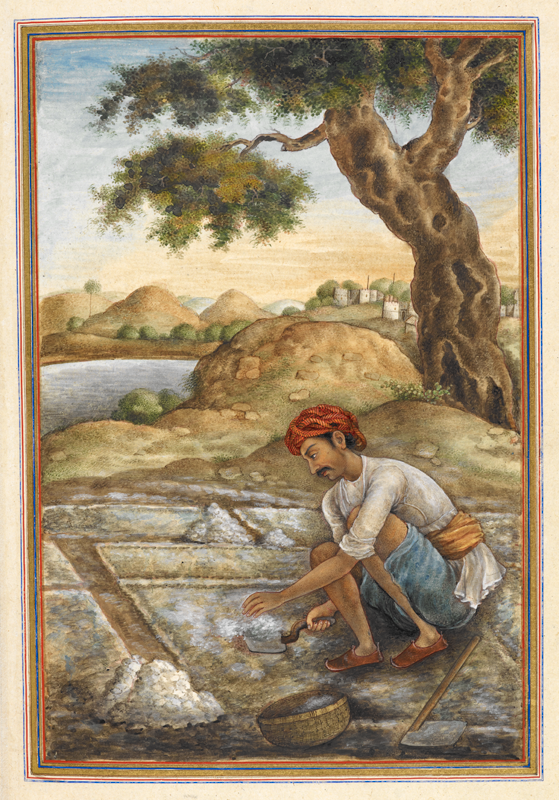 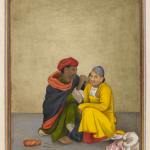 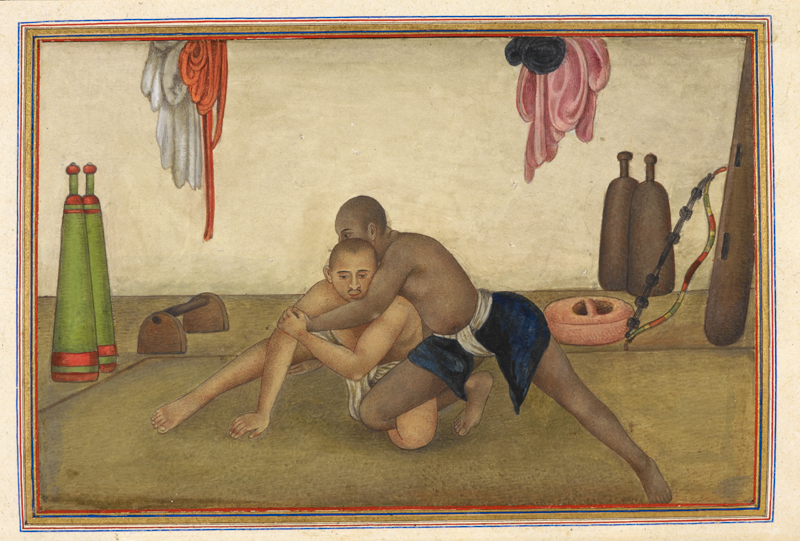 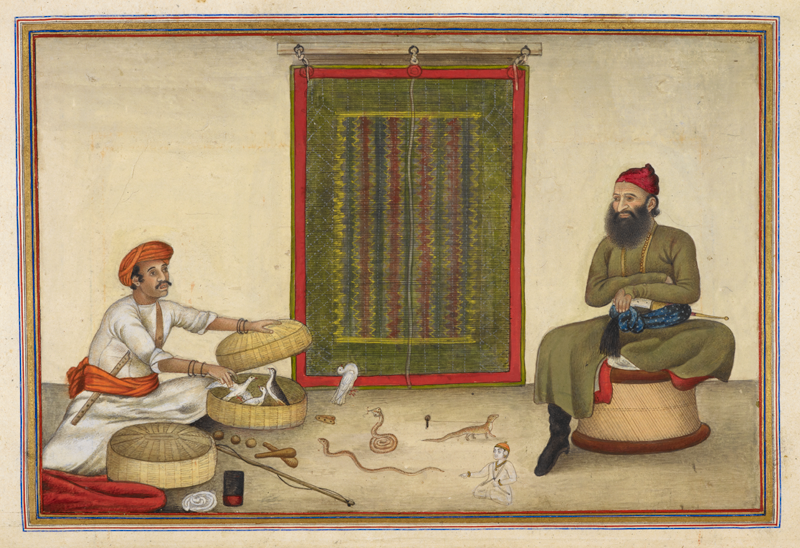 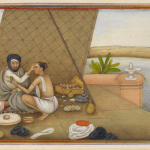 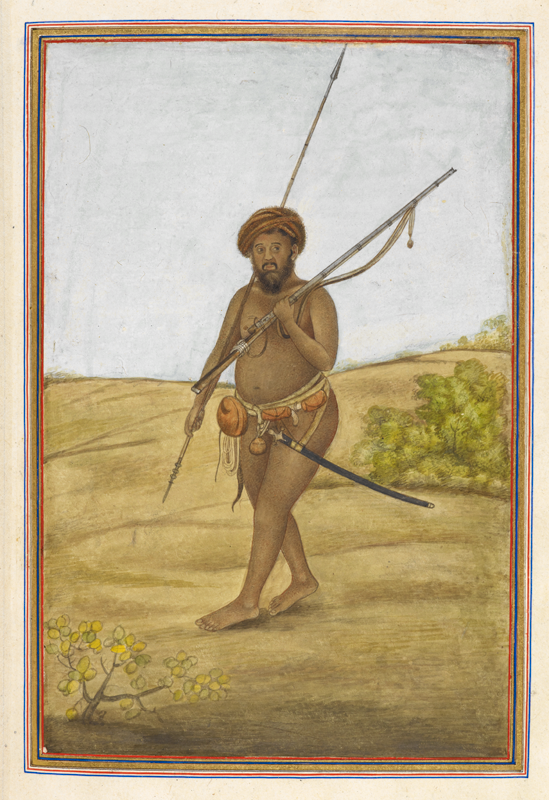 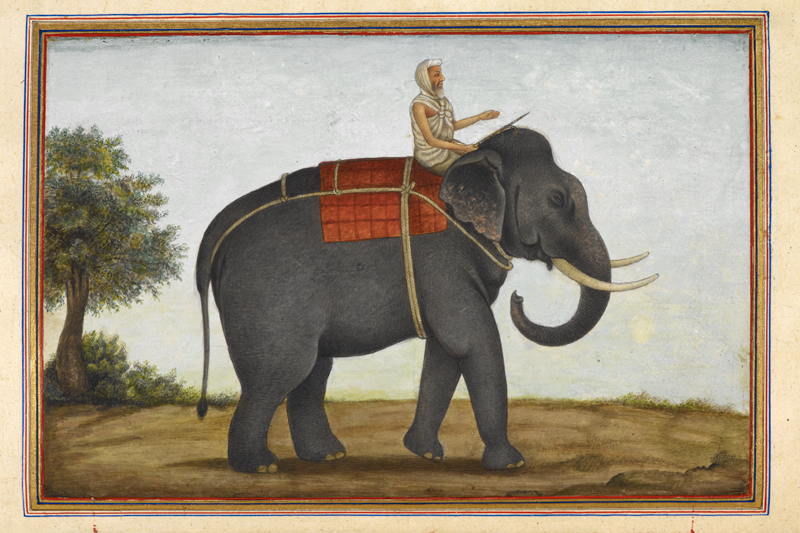 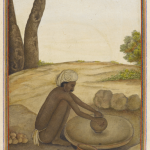 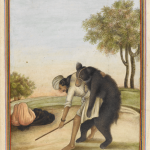 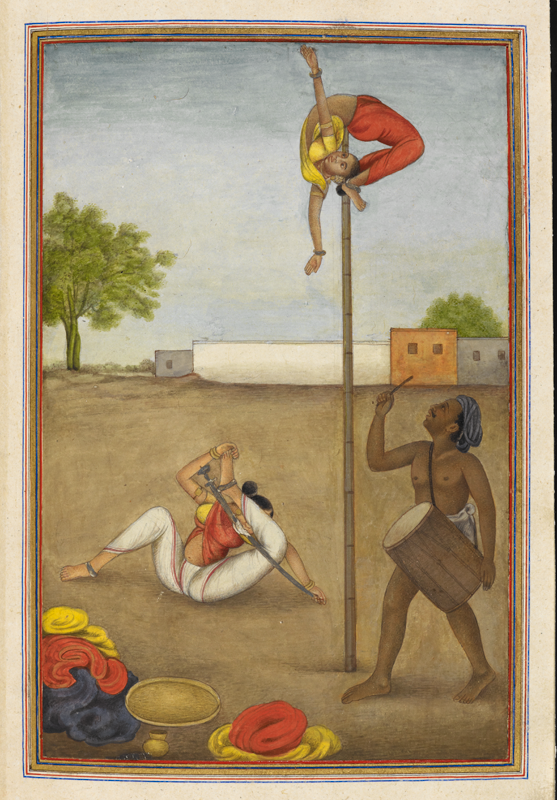 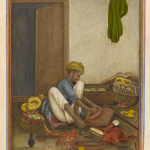 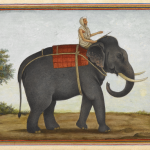 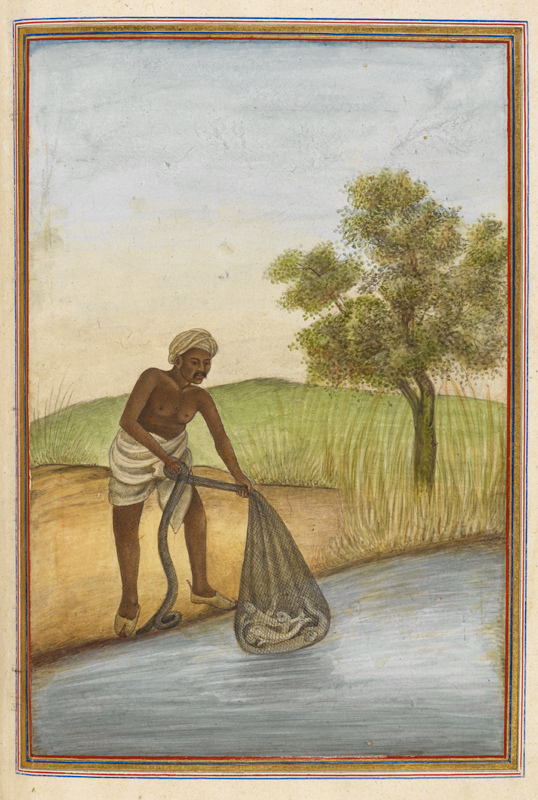 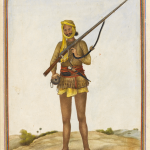 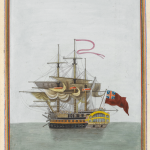 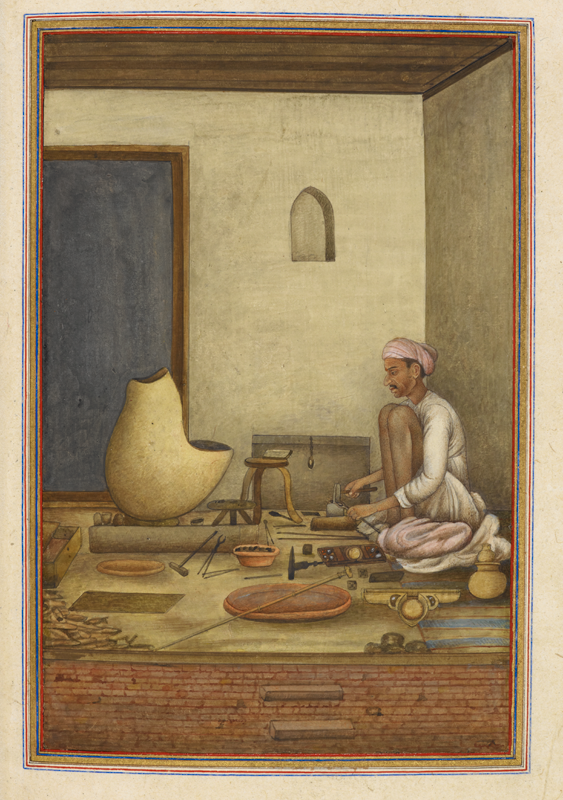 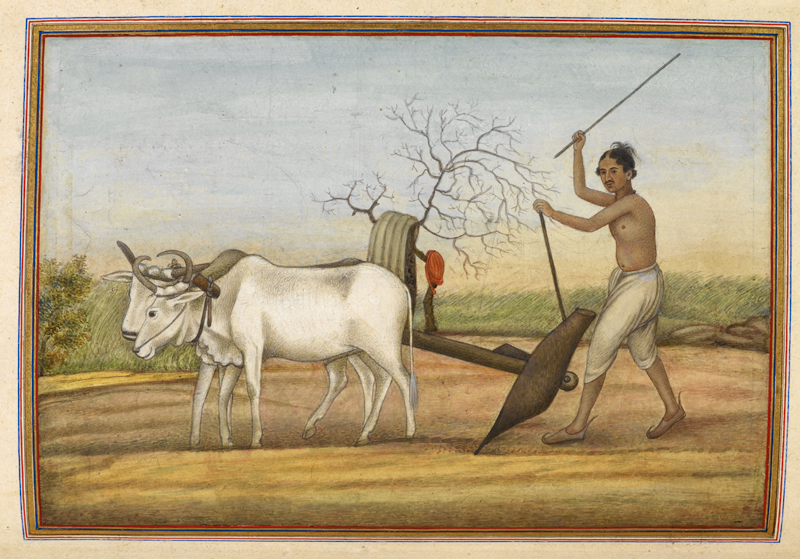 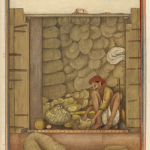 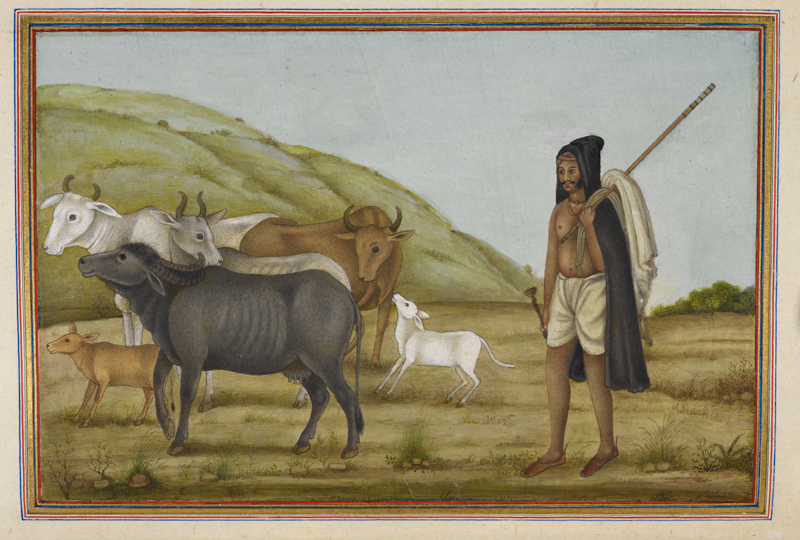 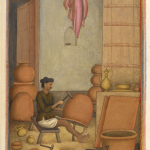 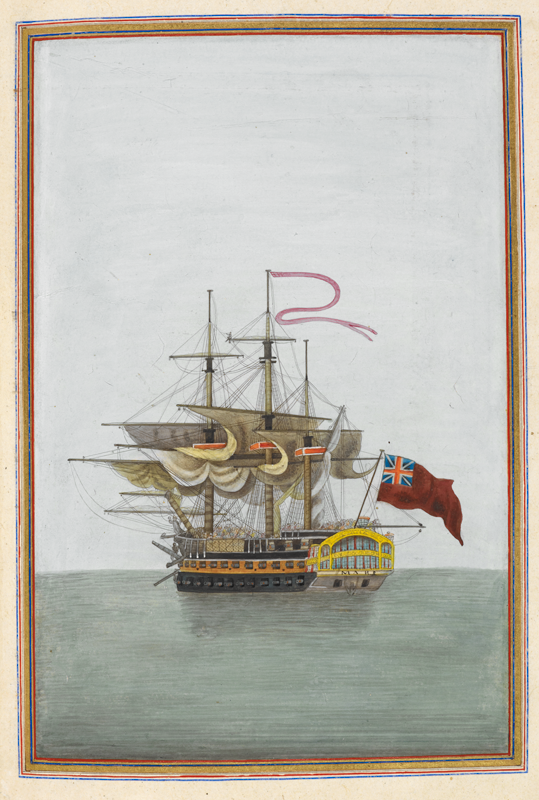 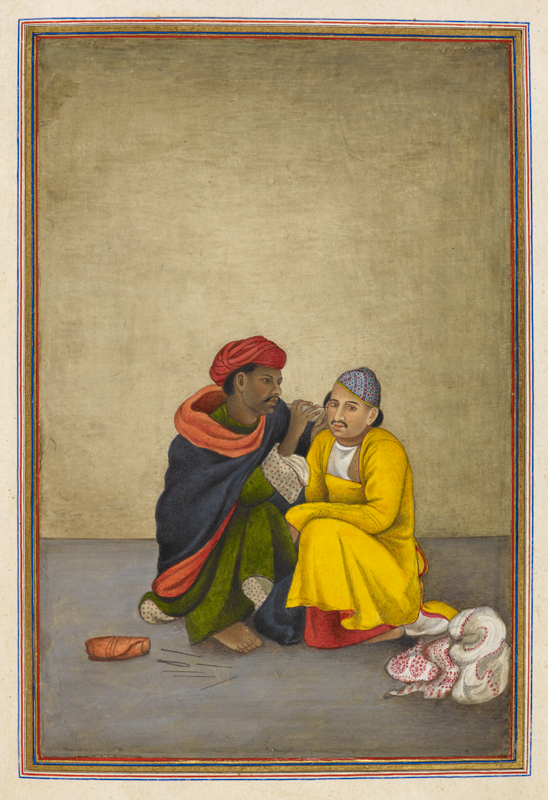 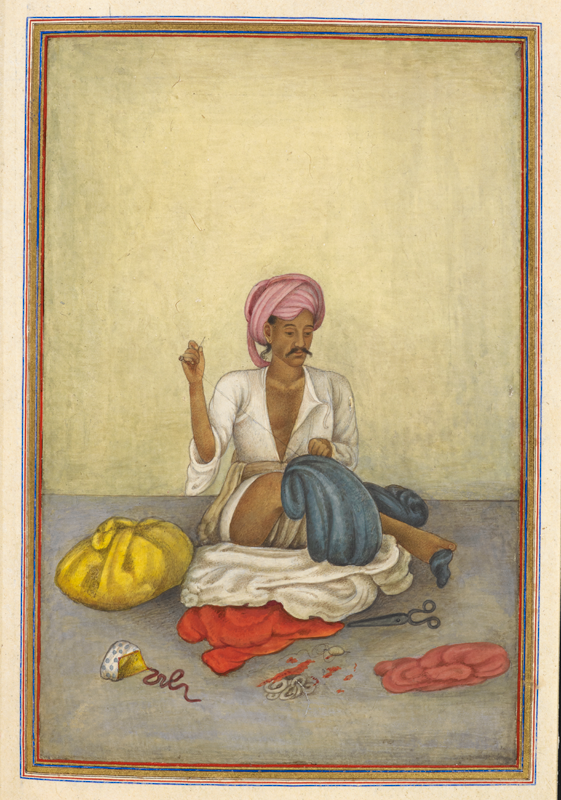 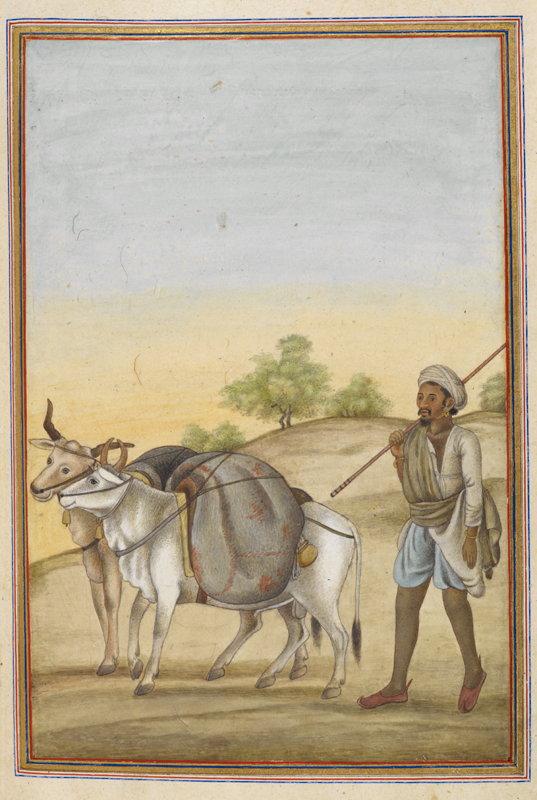 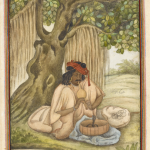 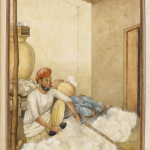 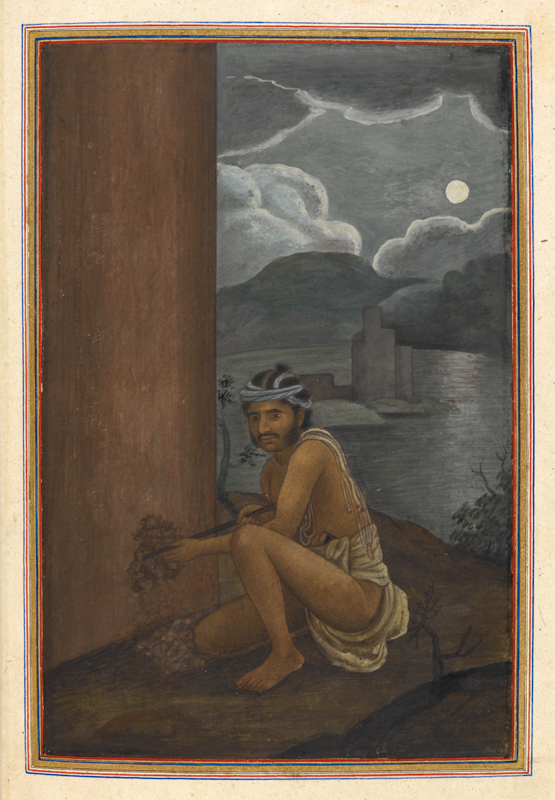 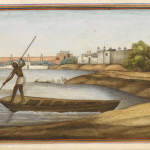 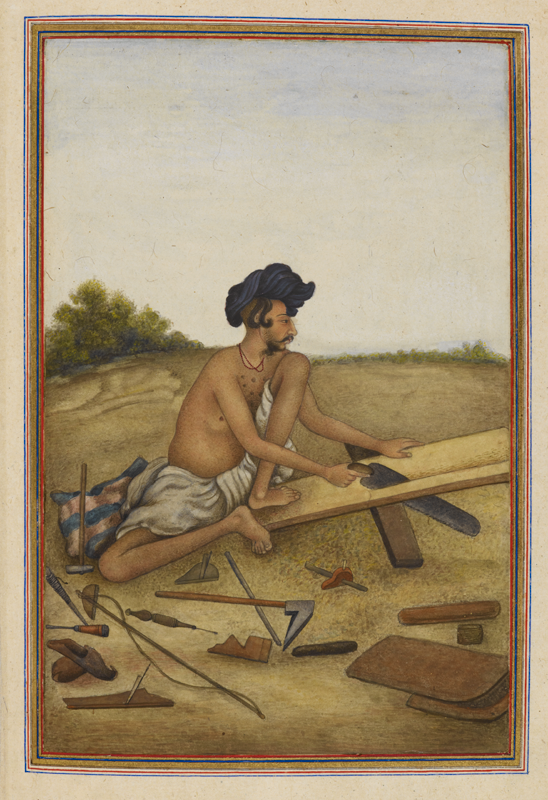 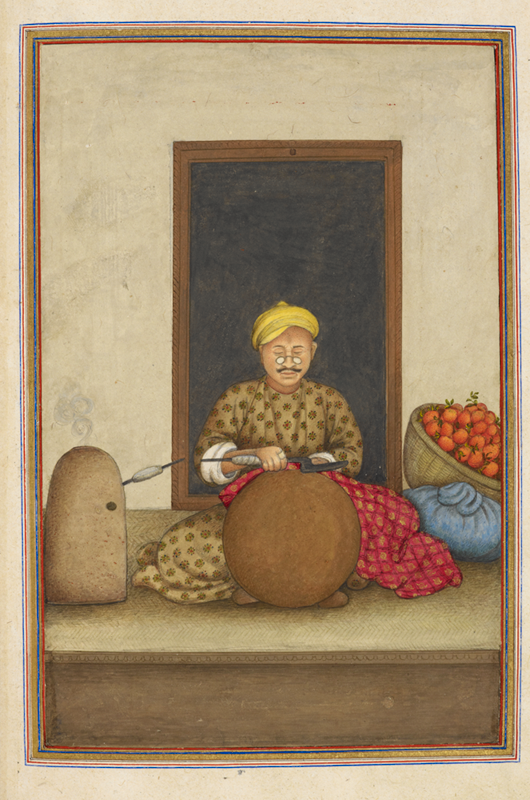 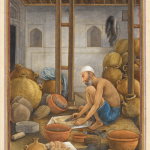 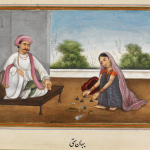 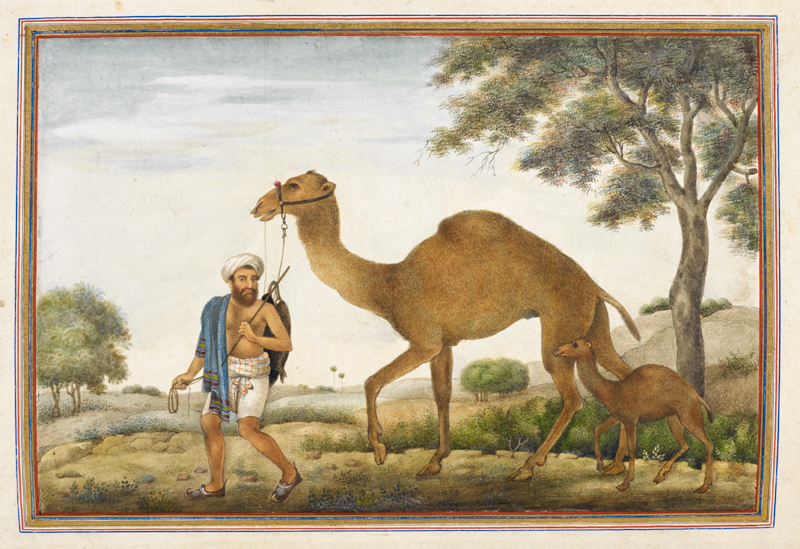 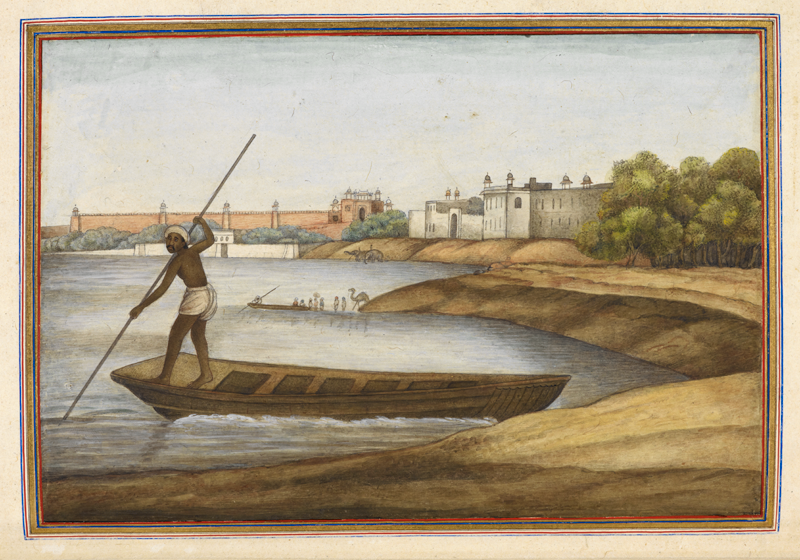 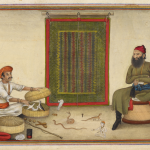 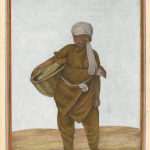 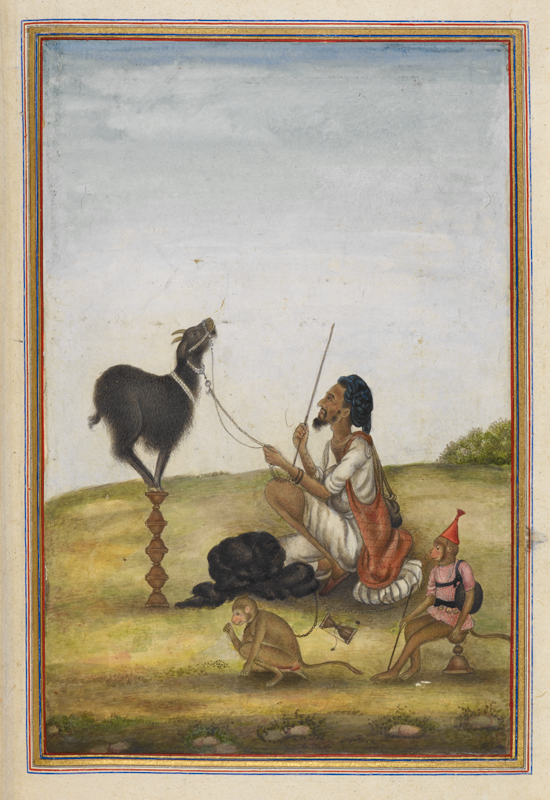 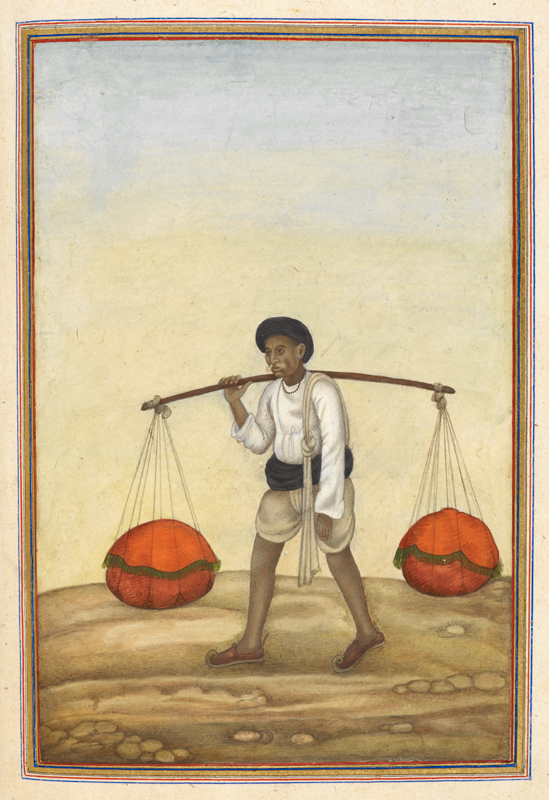 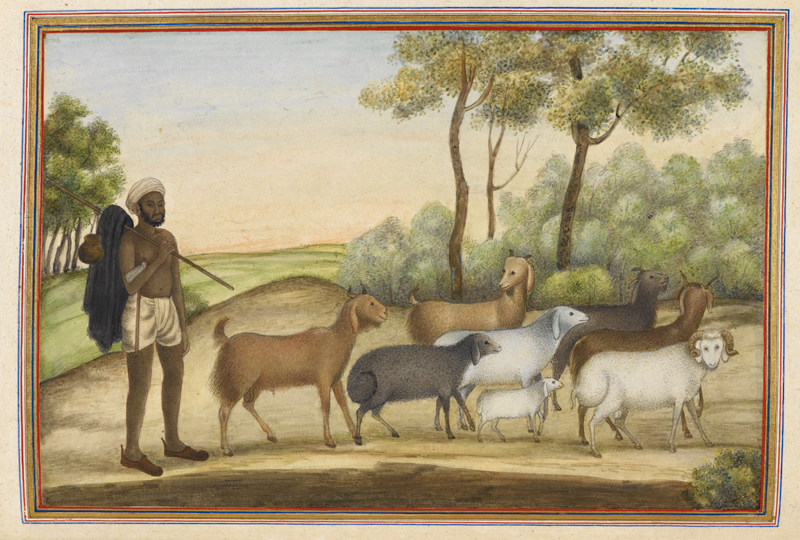 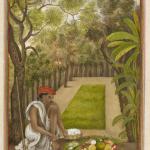 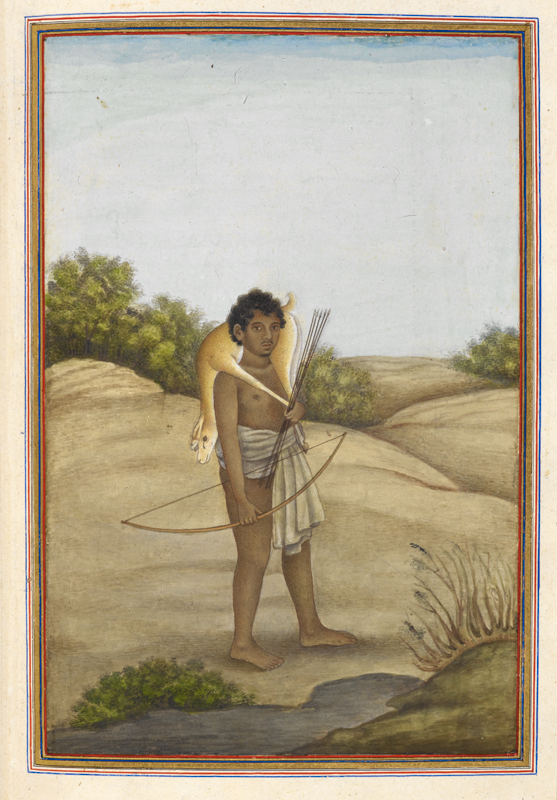 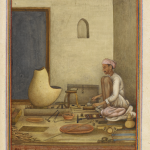 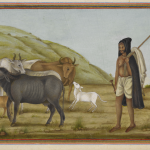 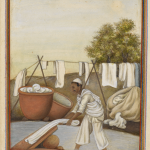 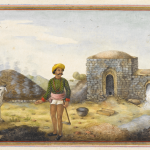 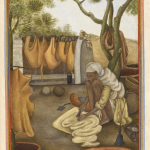 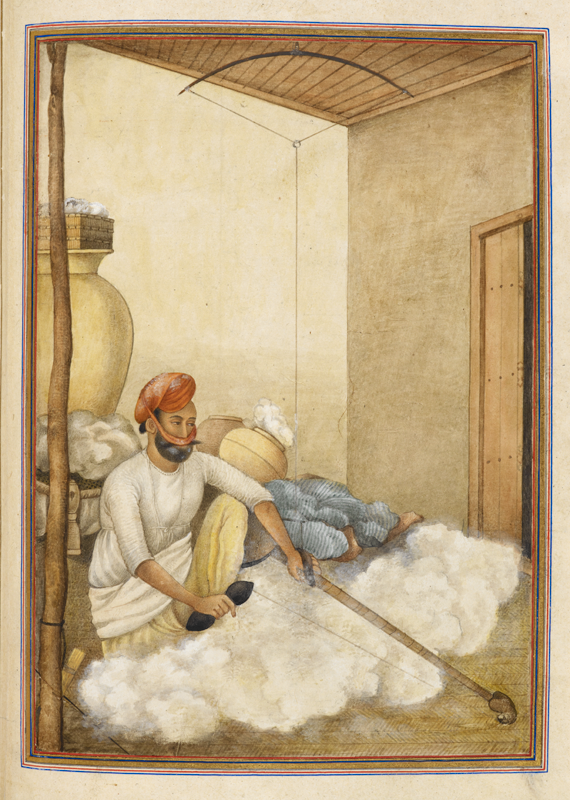 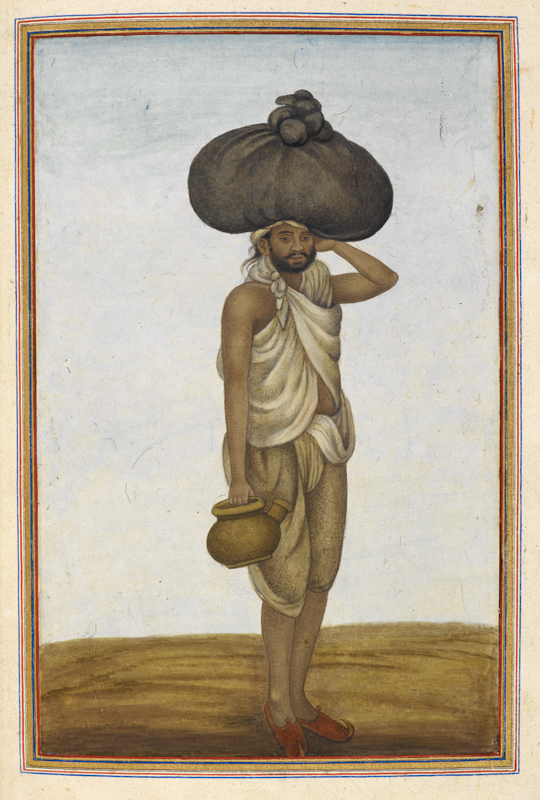 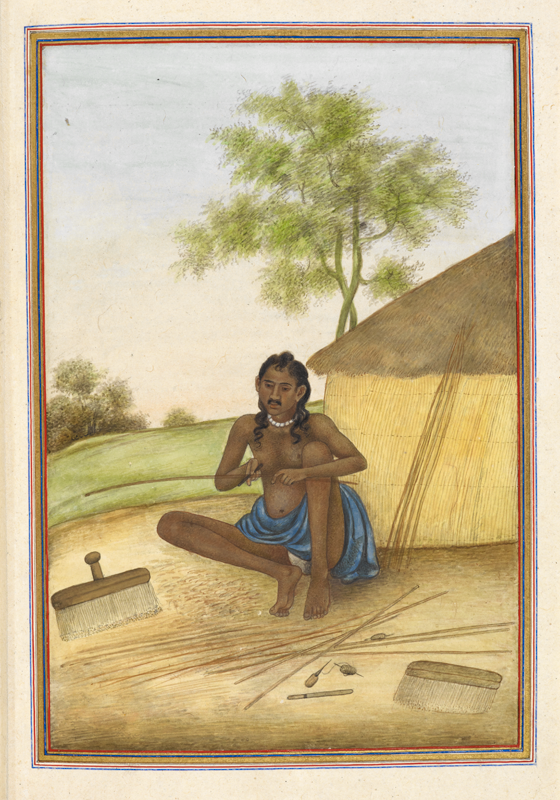 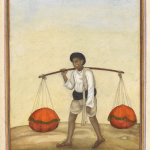 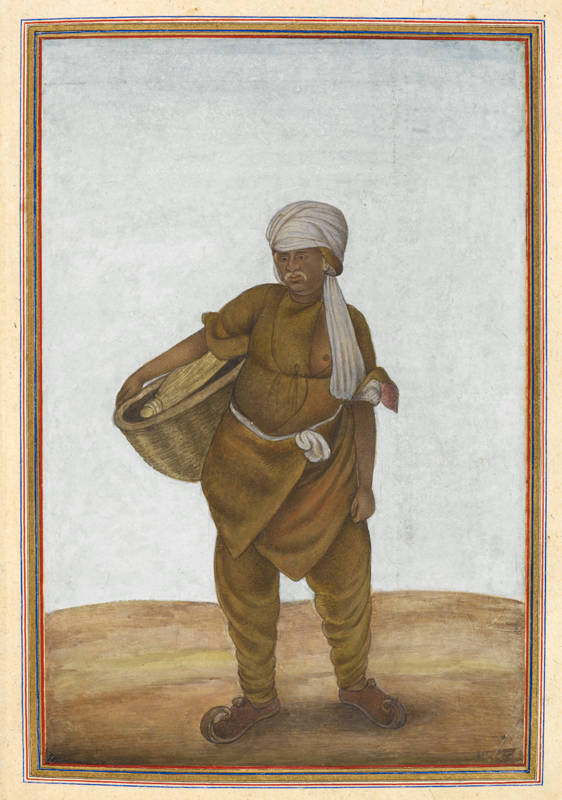 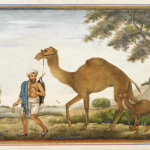 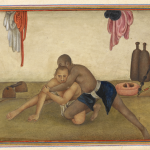 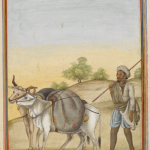 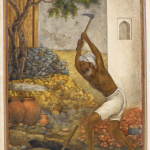 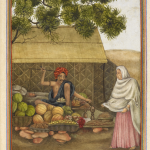 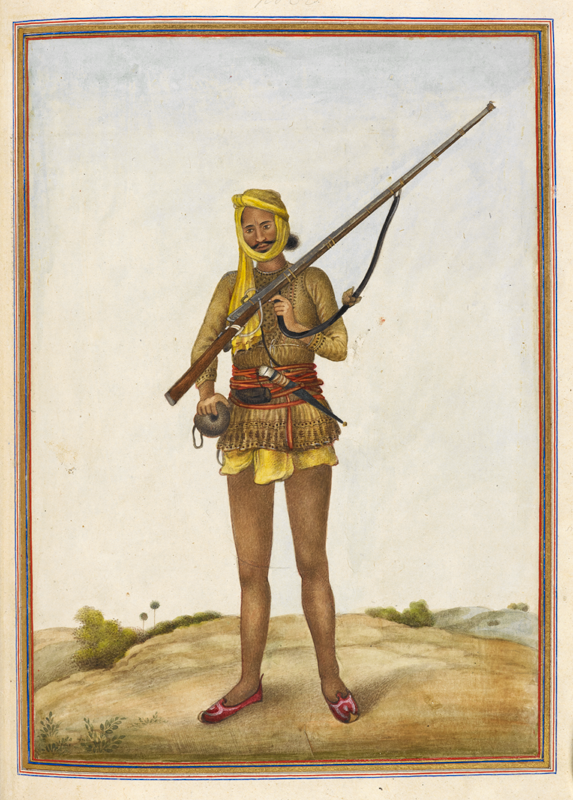 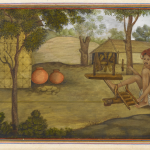 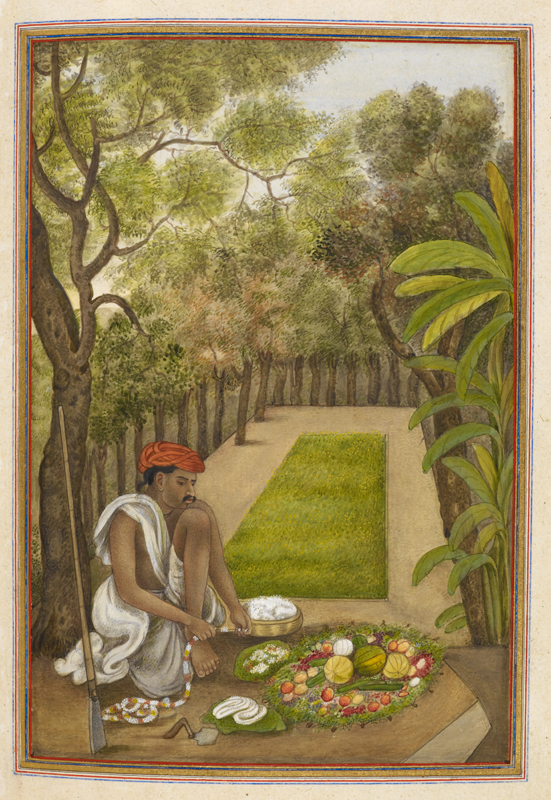 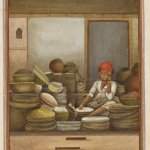 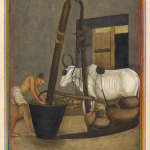 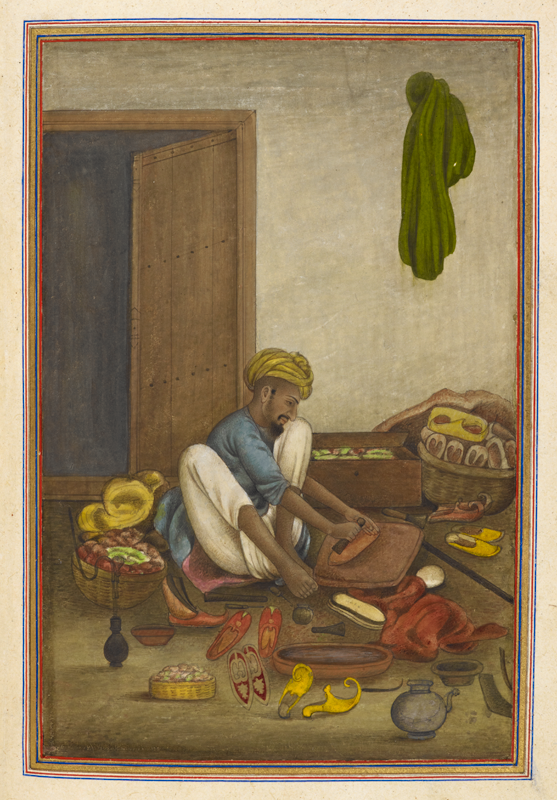 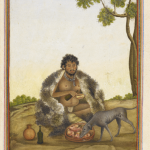 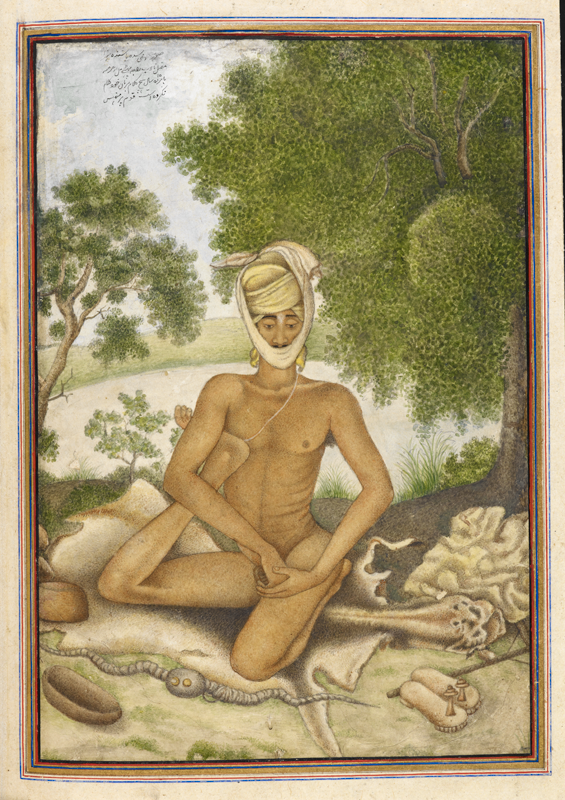 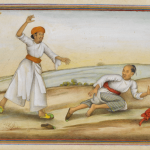 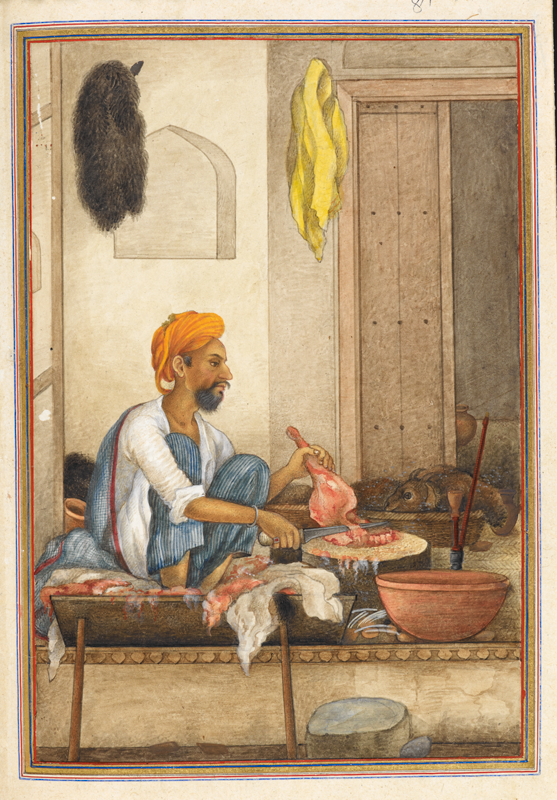 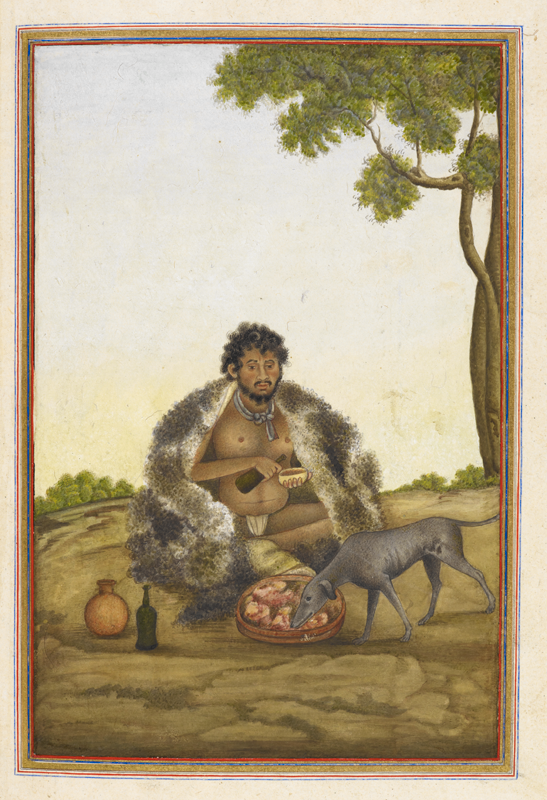 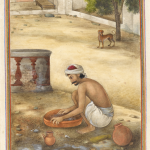 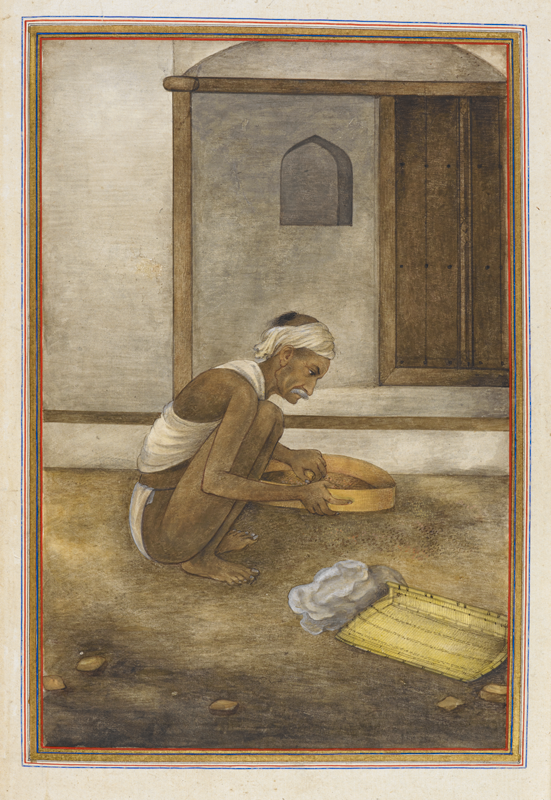 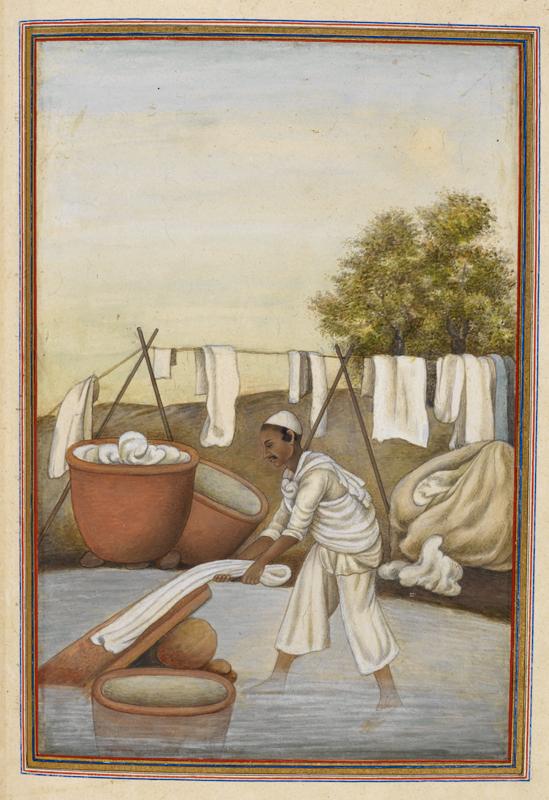 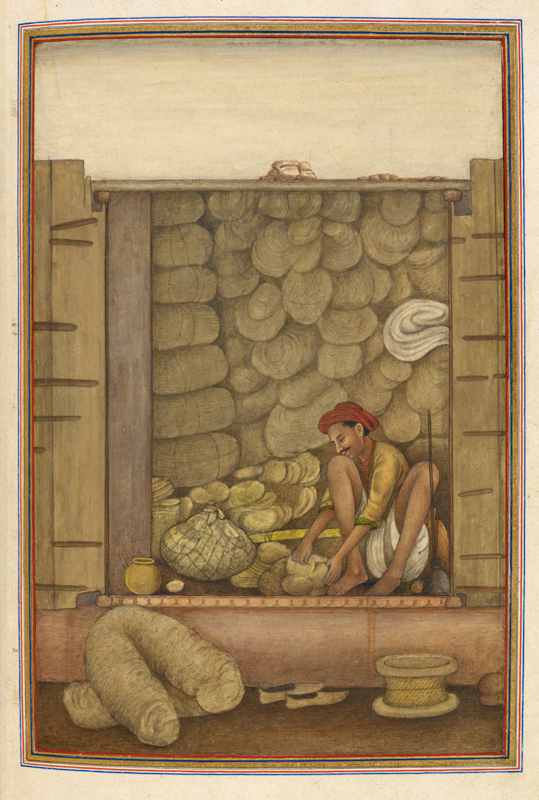 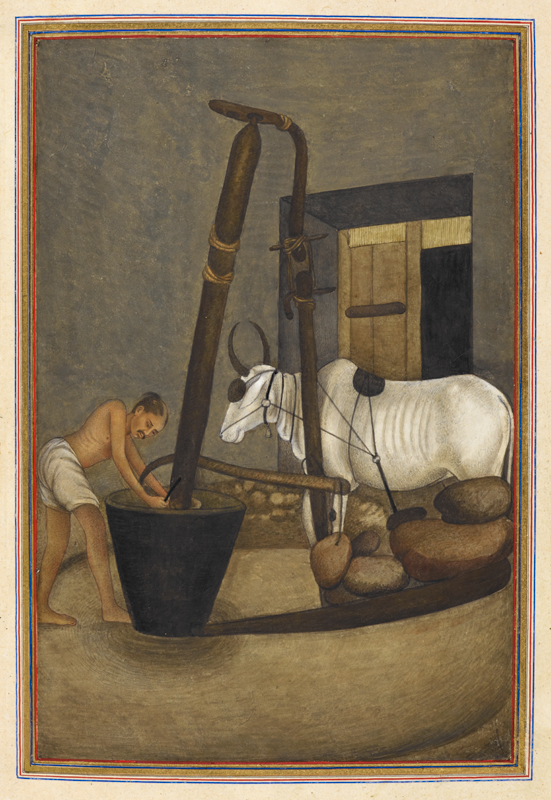 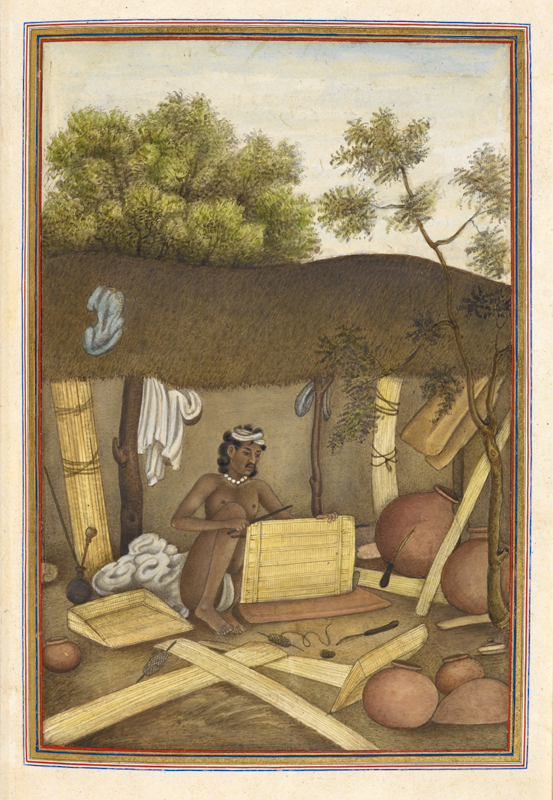 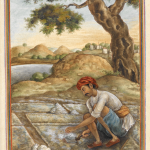 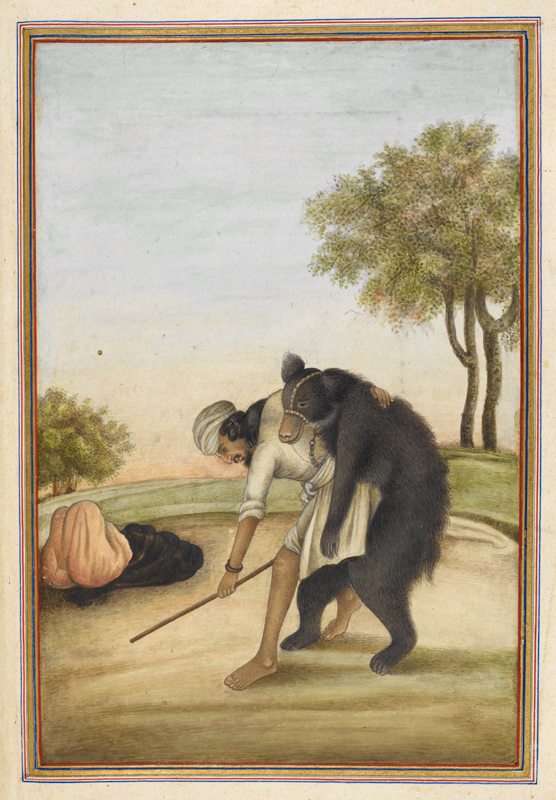 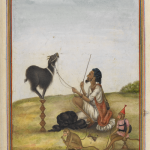 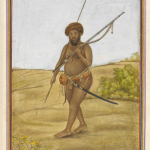 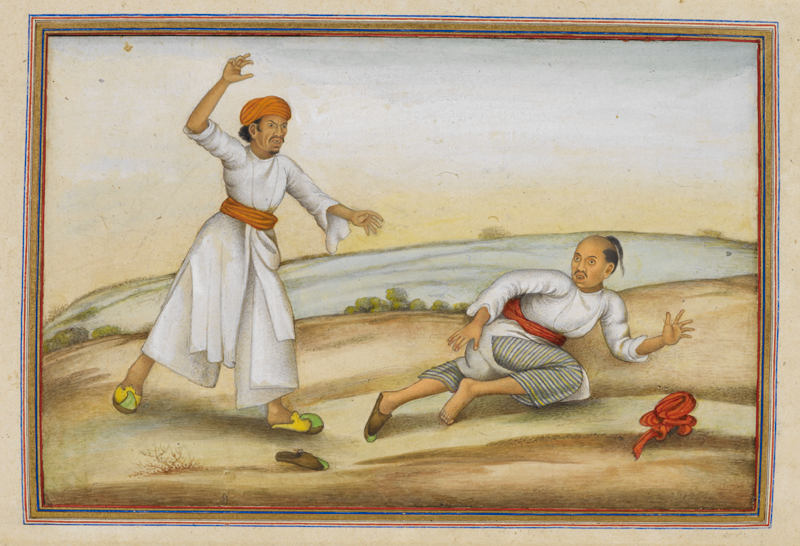 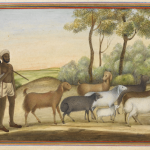 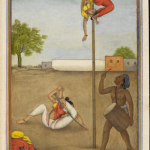 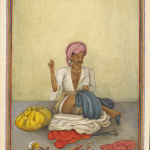 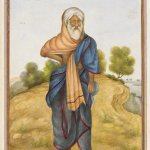 The illustrated Tashrih al-aqvam (an account of origins and occupations of some of the sects, castes, and tribes of India) was completed in 1825 and is part of the collection of the British Library. 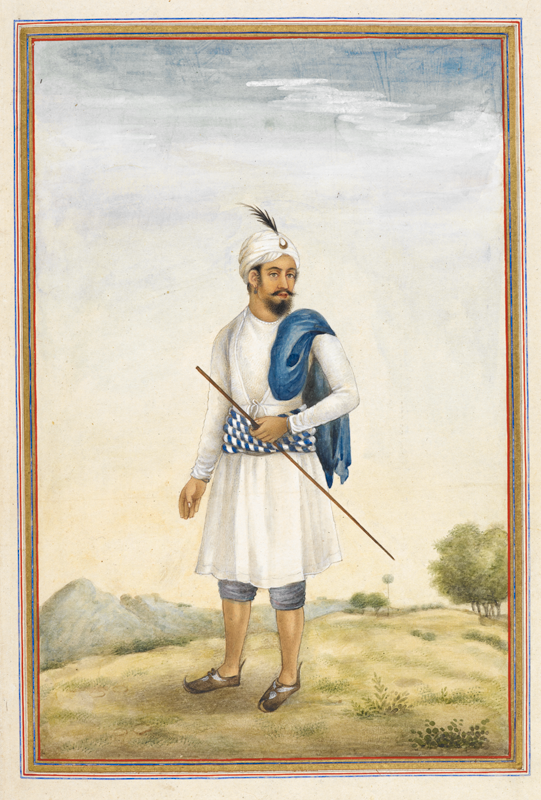 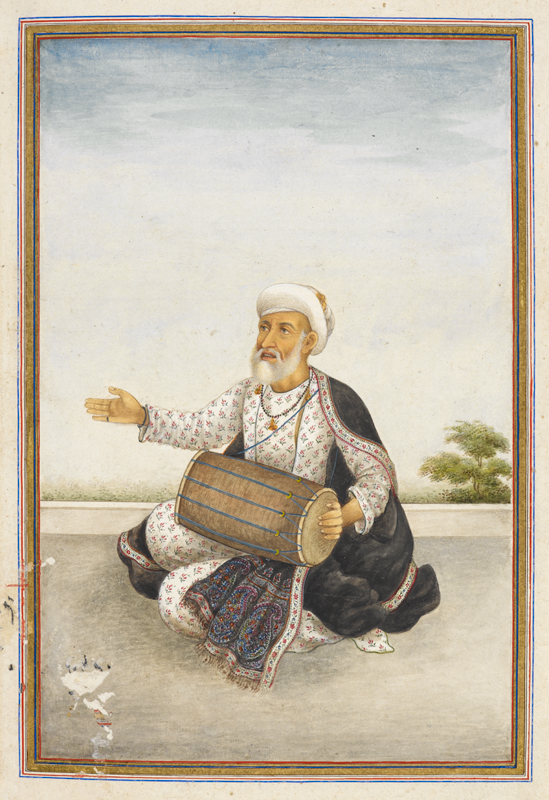 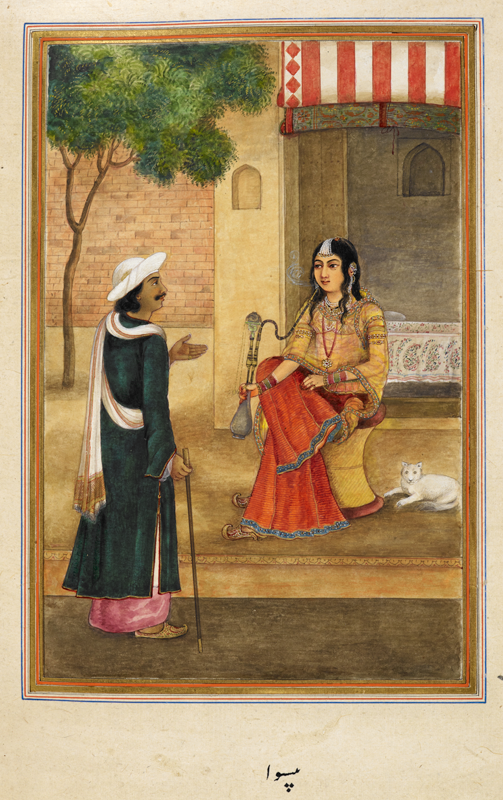 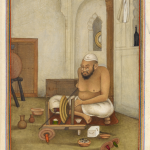 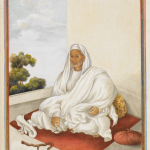 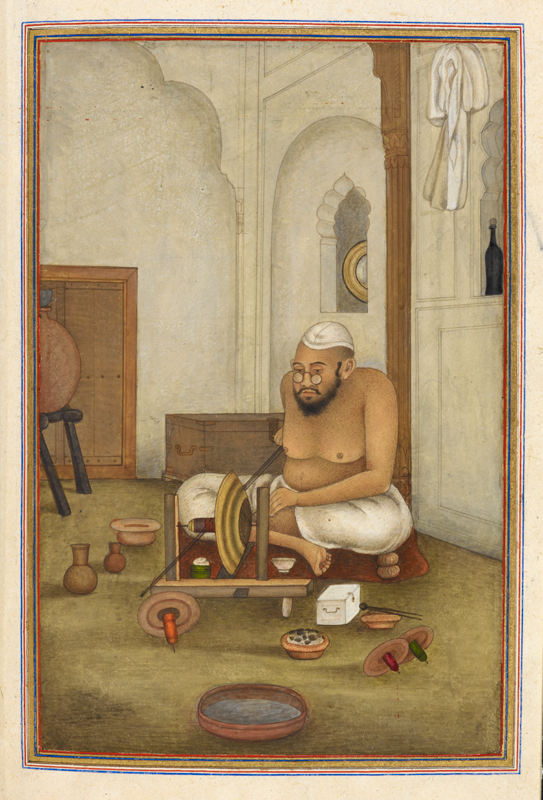 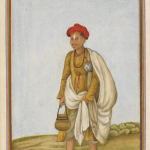 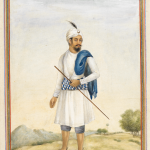 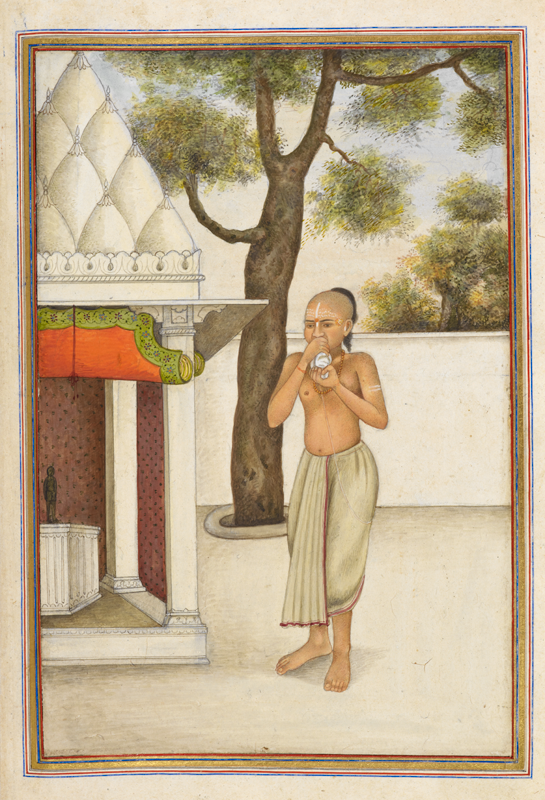 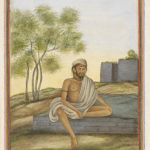 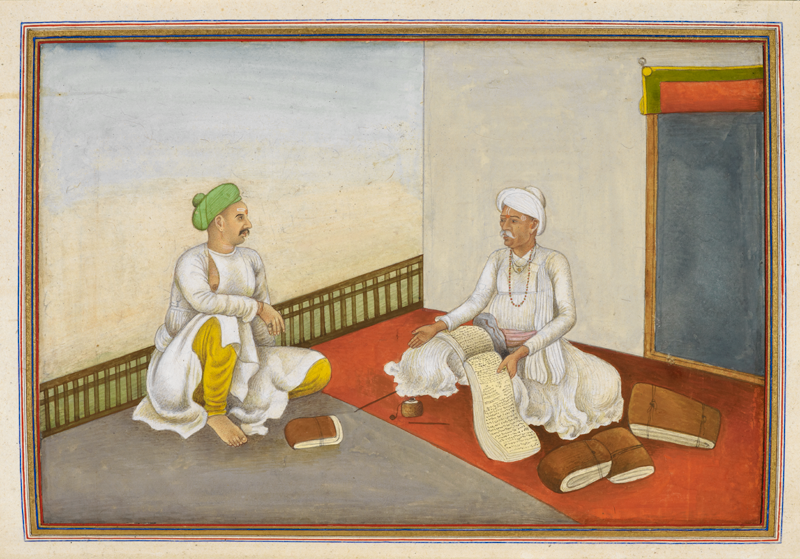 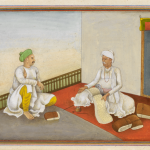 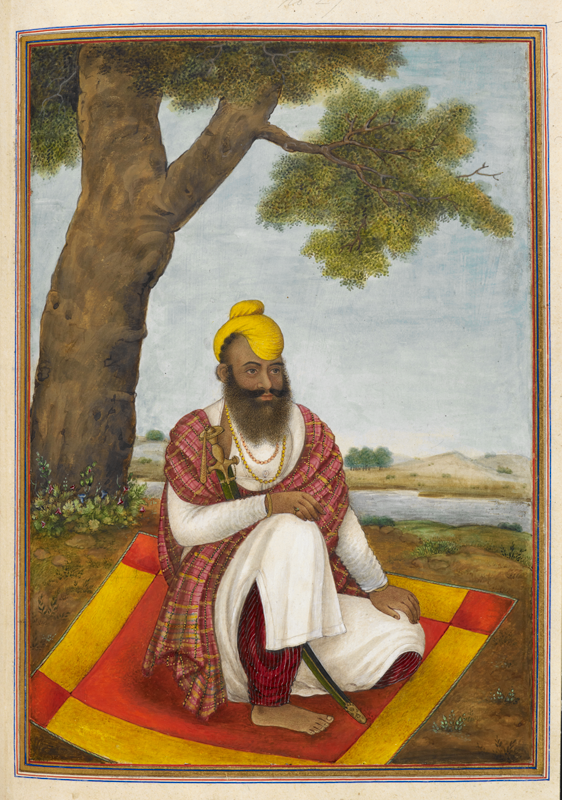 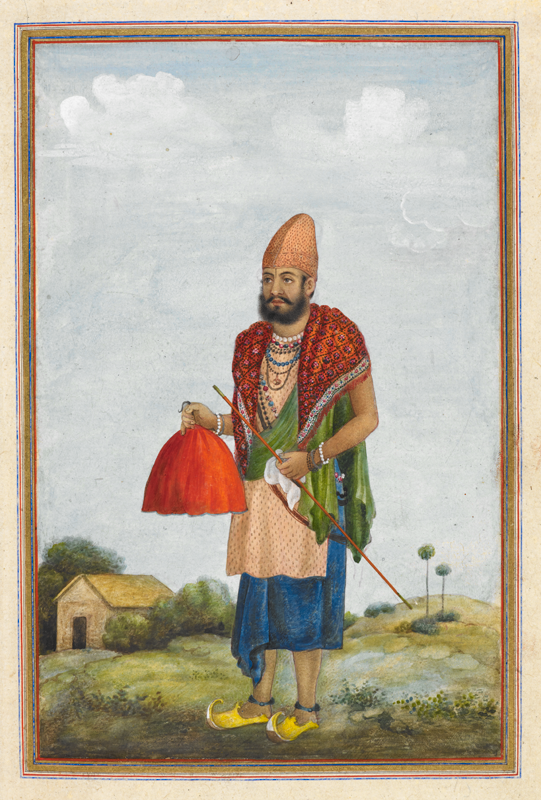 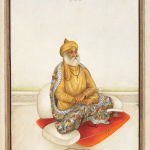 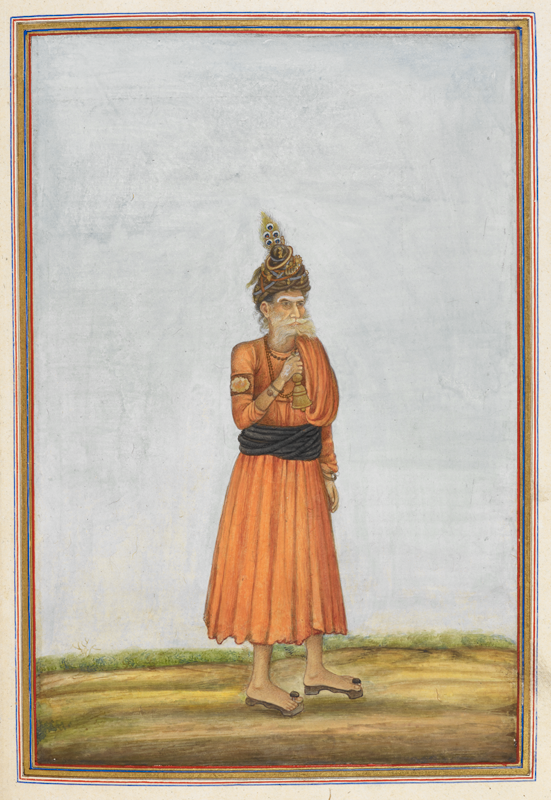 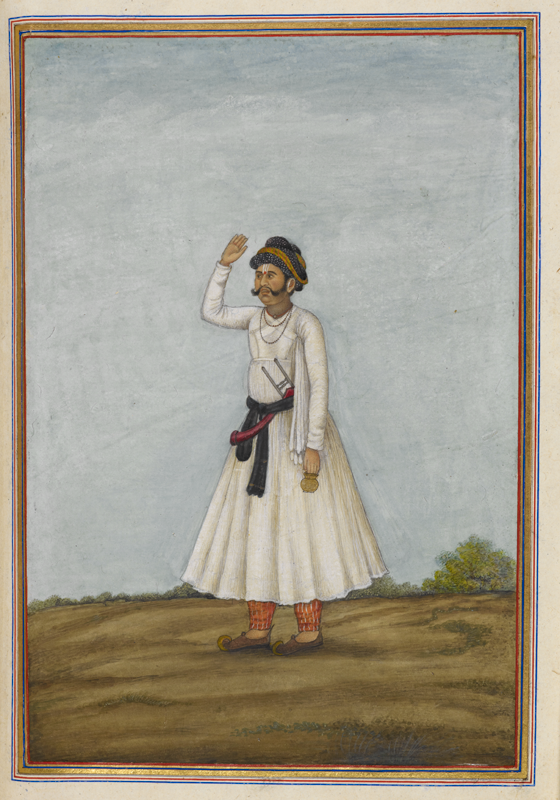 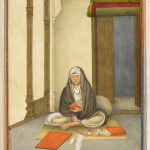 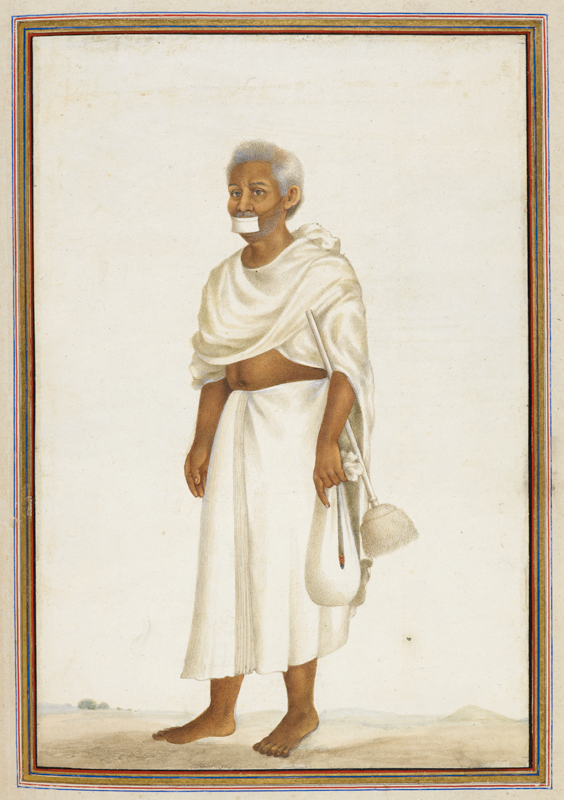 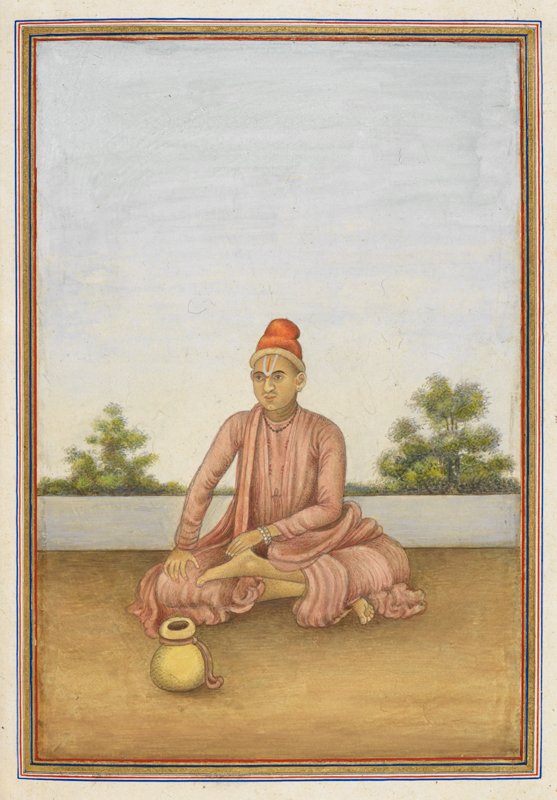 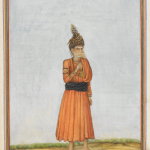 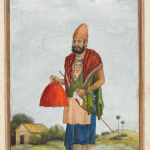 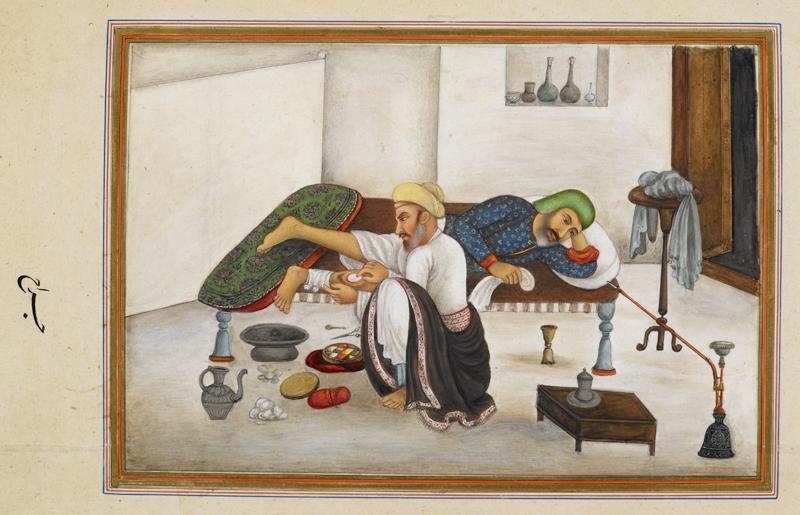 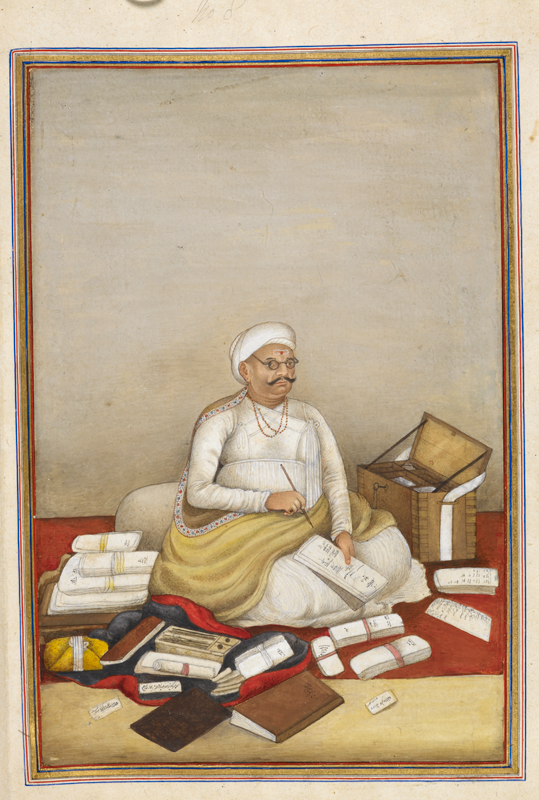 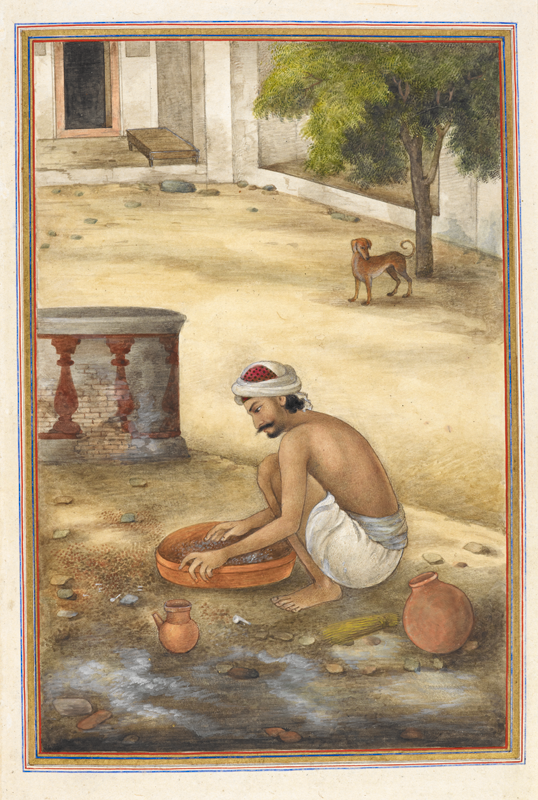 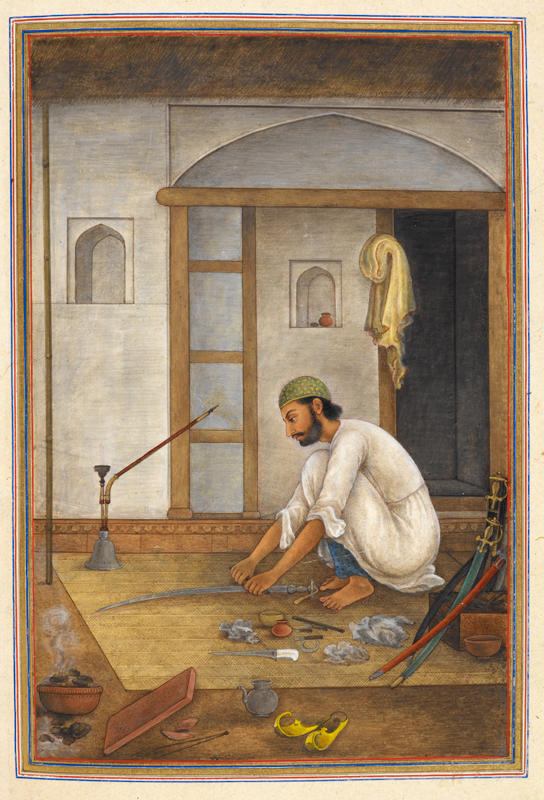 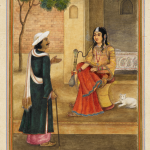 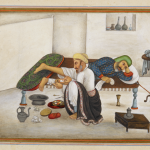 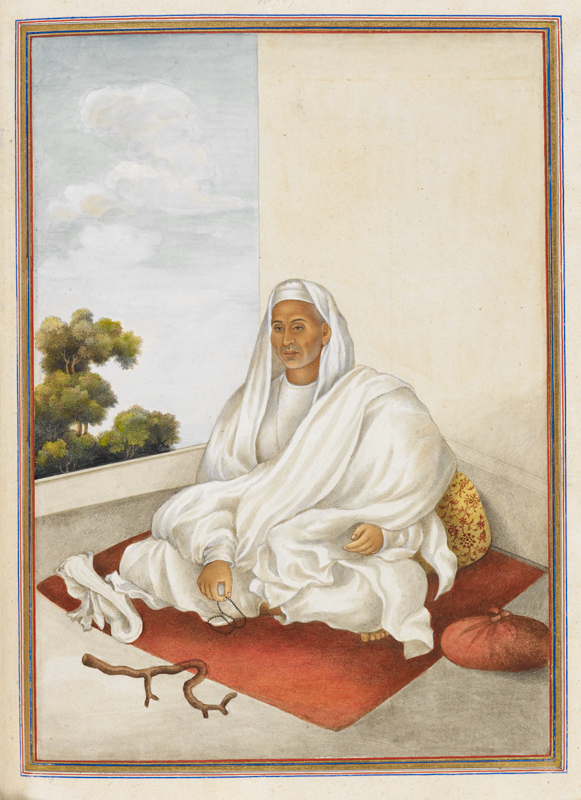 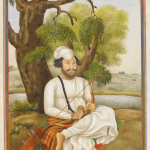 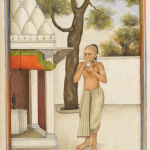 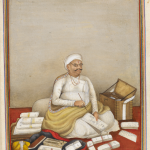 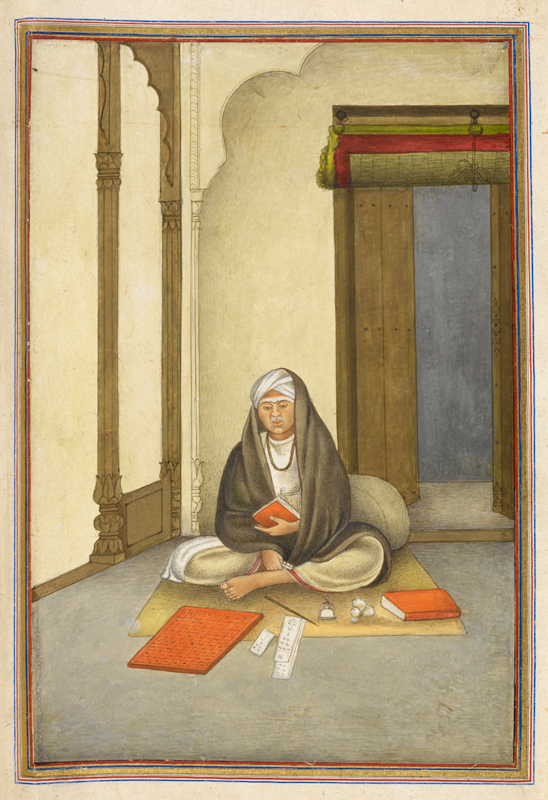 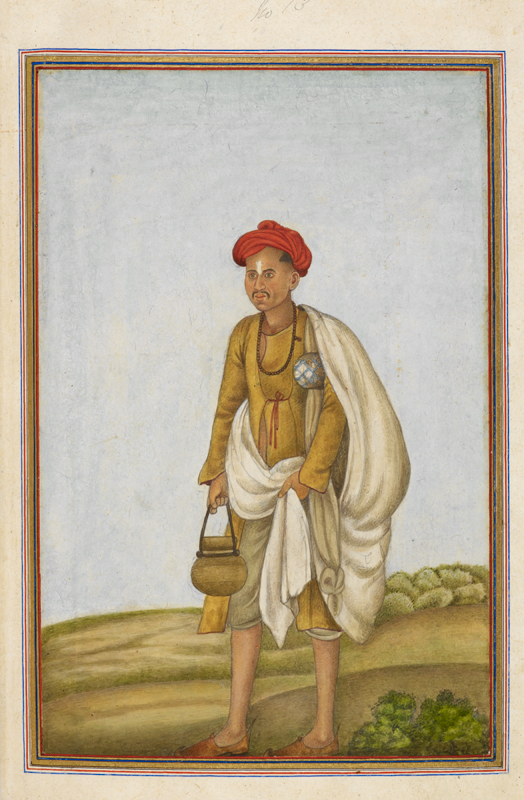 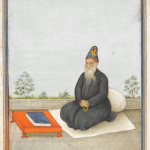 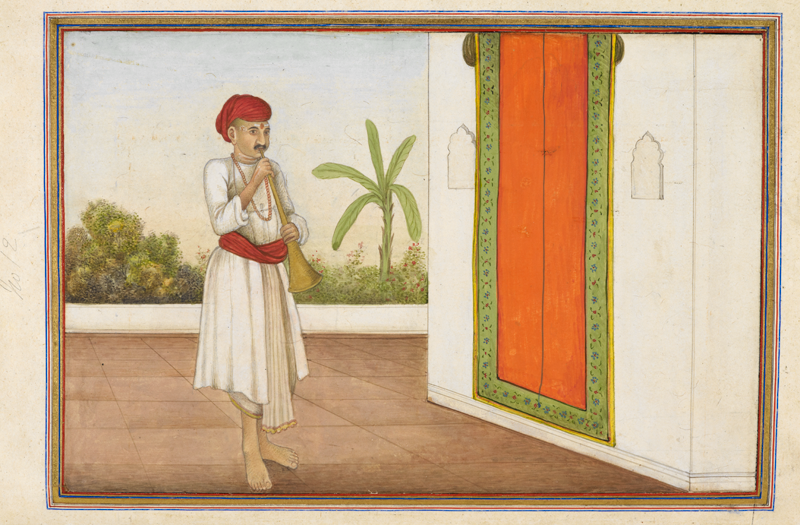 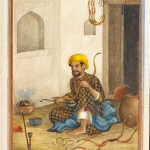 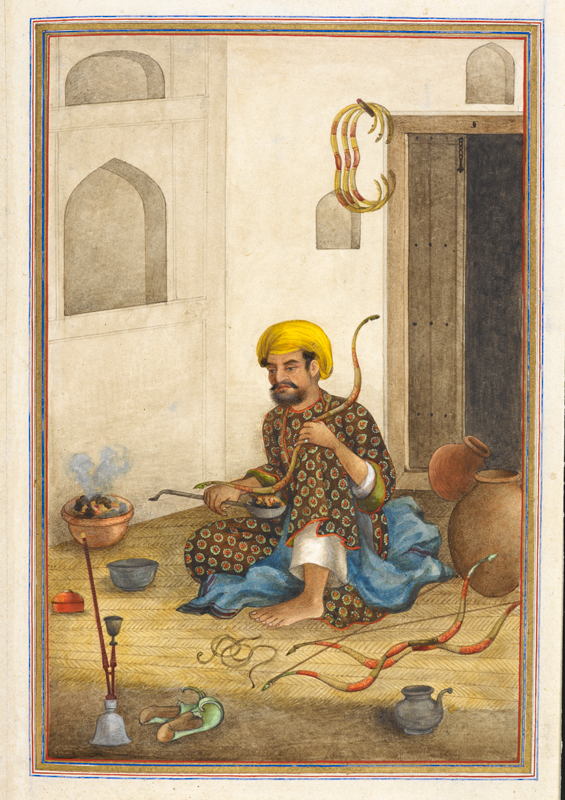 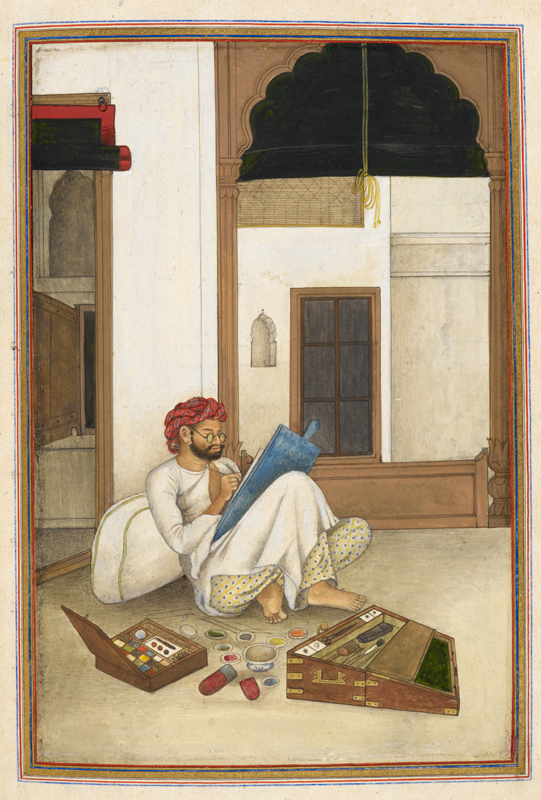 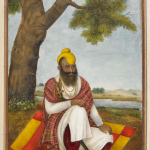 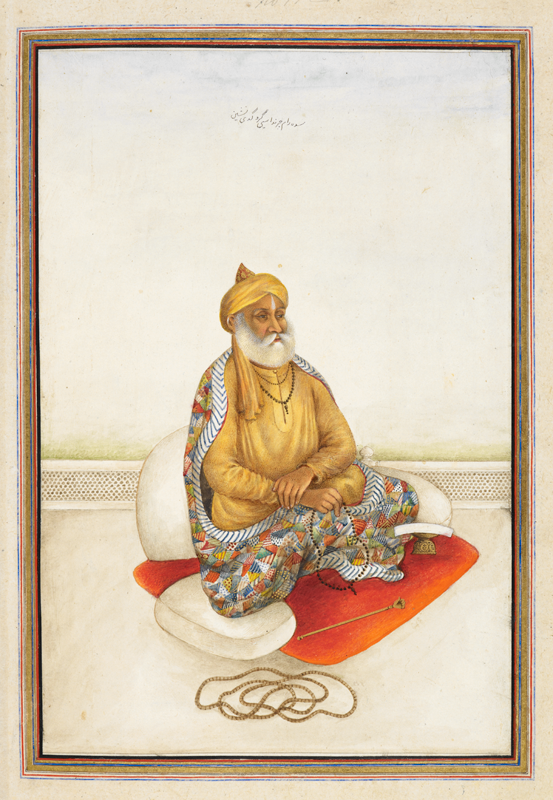 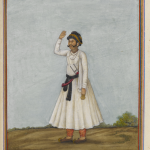 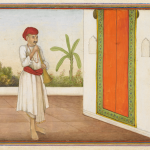 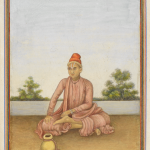 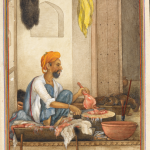 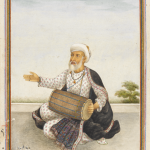 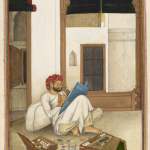 The text, a summary of the Vedas and Shastras, translated into Persian by Colonel James Skinner (1778–1841), is a survey of both Hindu and Muslim occupational groups and religious mendicants in the Delhi region and begins with an account of the house of Timur down to Akbar II (reigned 1806–37). 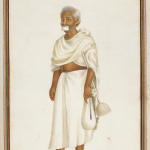 The largest section is devoted to the various Hindu castes found in the area around Delhi. 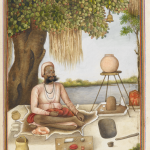 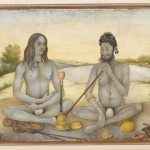 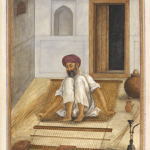 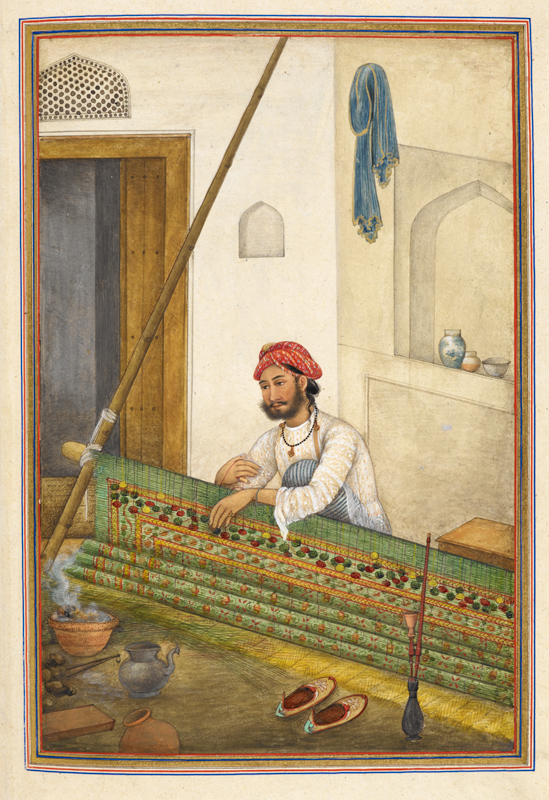 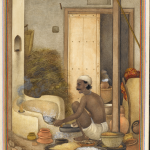 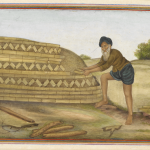 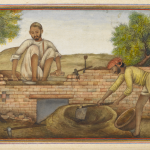 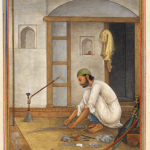 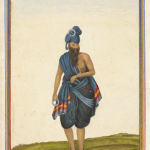 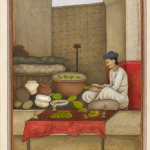 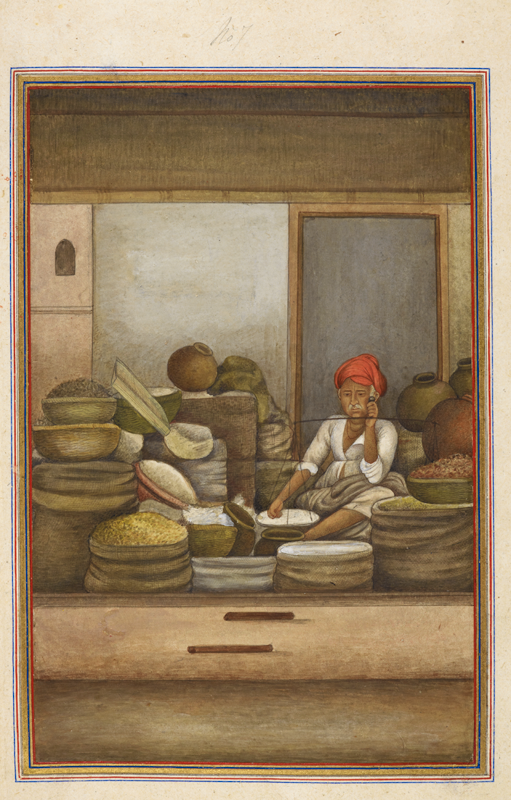 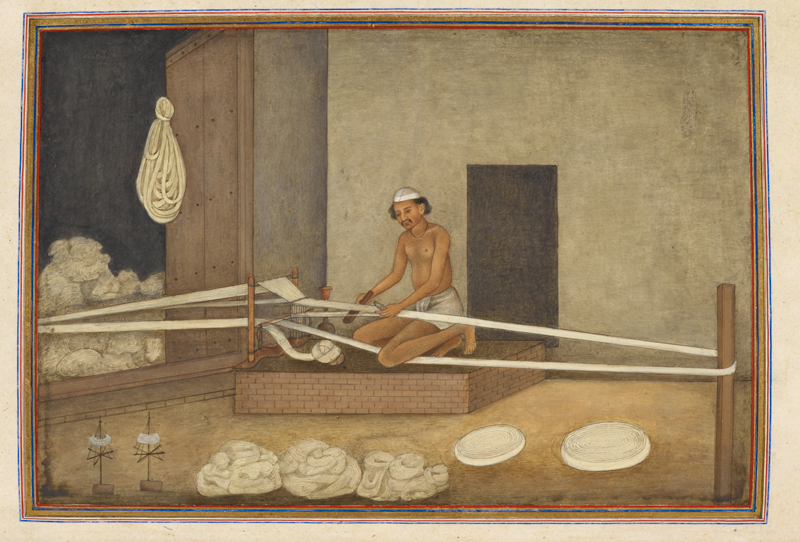 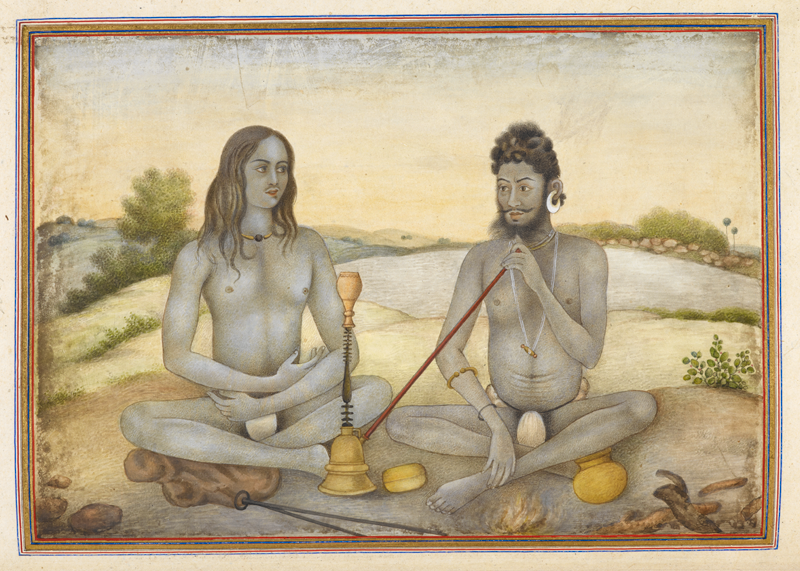 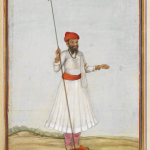 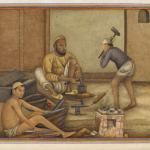 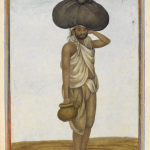 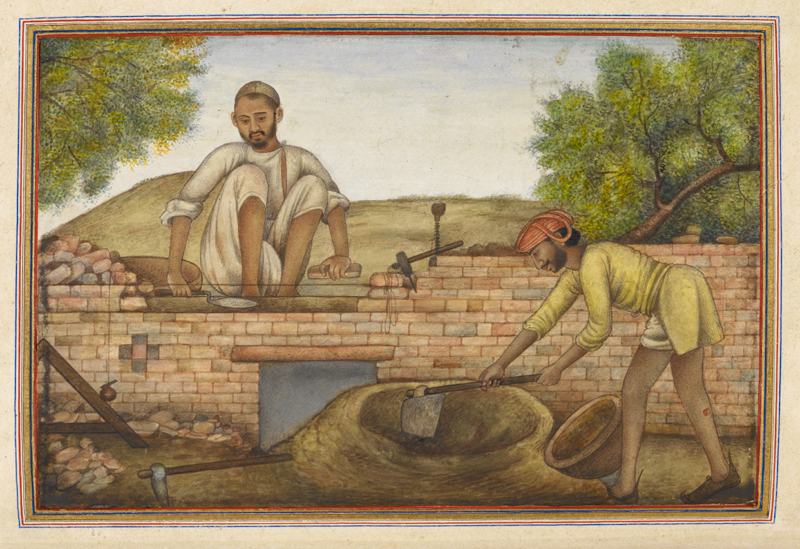 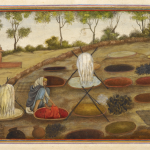 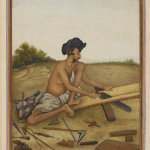 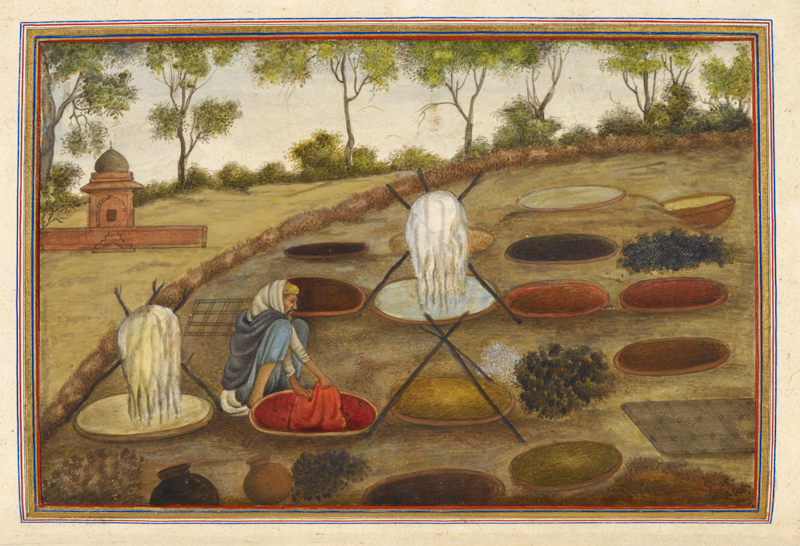 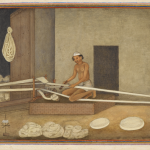 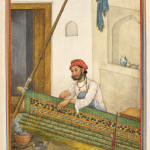 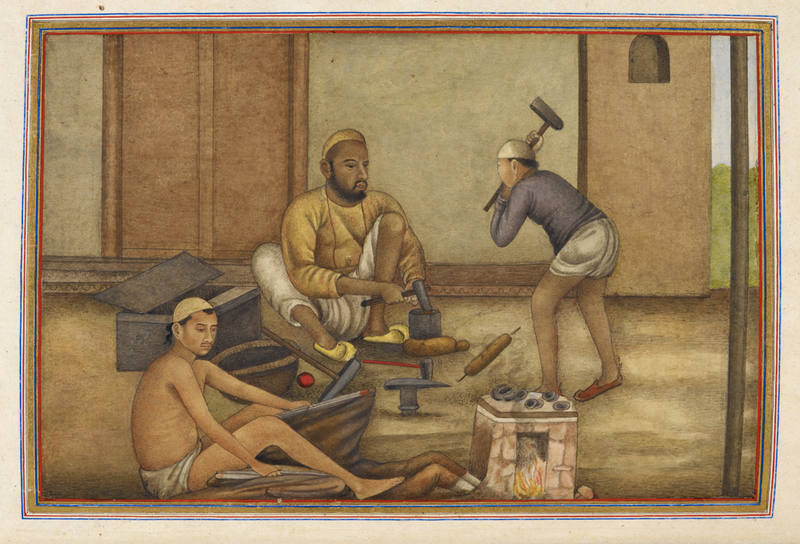 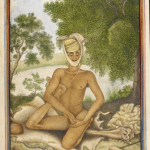 In addition to these major occupational groups, The text also discusses Hindu, Jain, and Sikh religious mendicants such as yogis and sanyasis; after listing the kings of Avadh, the book describes the Muslim Afghans of Kasur, qawwals, and fakirs. 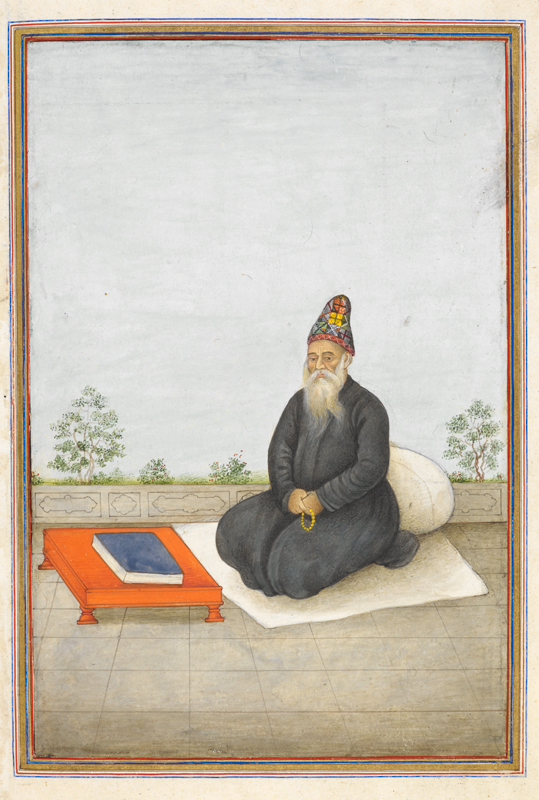 The Tashrih al-aqvam, along with the Tazkirat al-umara (historical notices of some princely families of Rajasthan and the Panjab)—also by James Skinner and illustrated—are examples of a new kind of nonliterary Persian text written by, or under the patronage of the British that emerged in late Mughal literary culture and combined topography, biography, and ethnography. 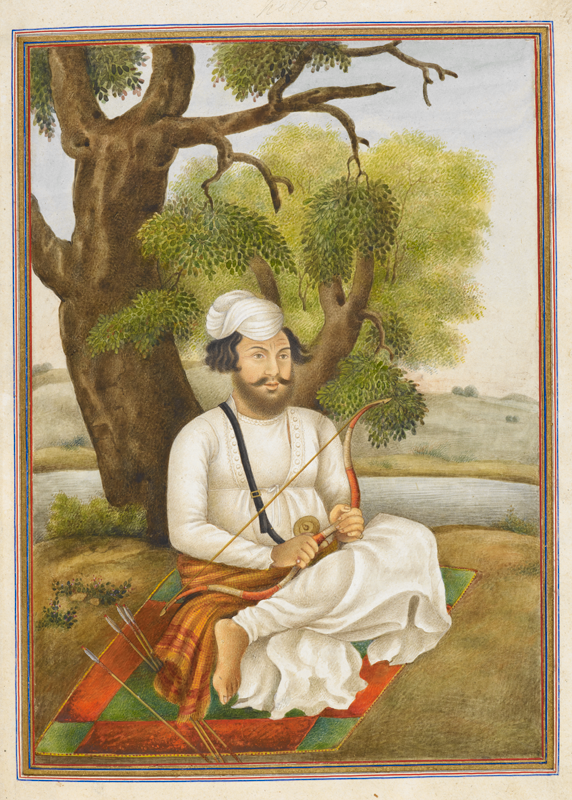 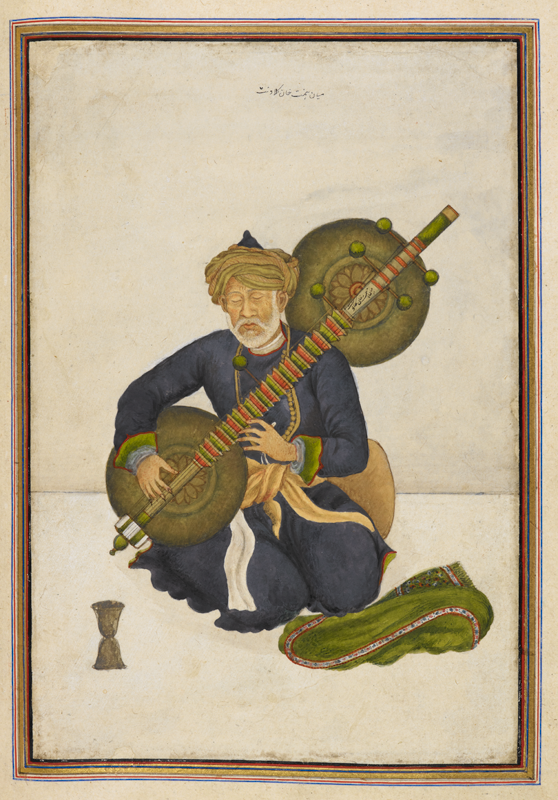 Skinner commissioned Delhi artists to illustrate the album, the chief of them being Ghulam Ali Khan. 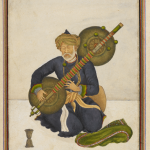 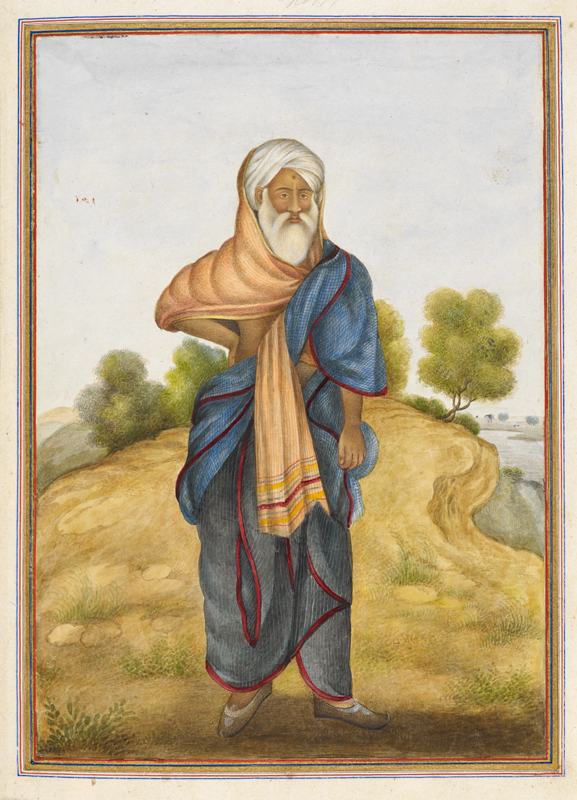 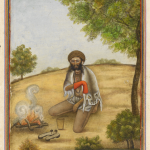 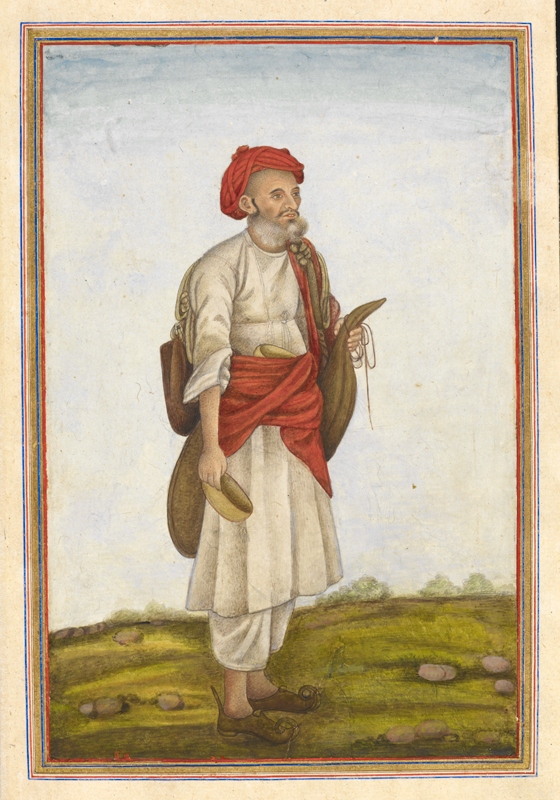 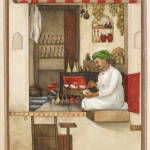 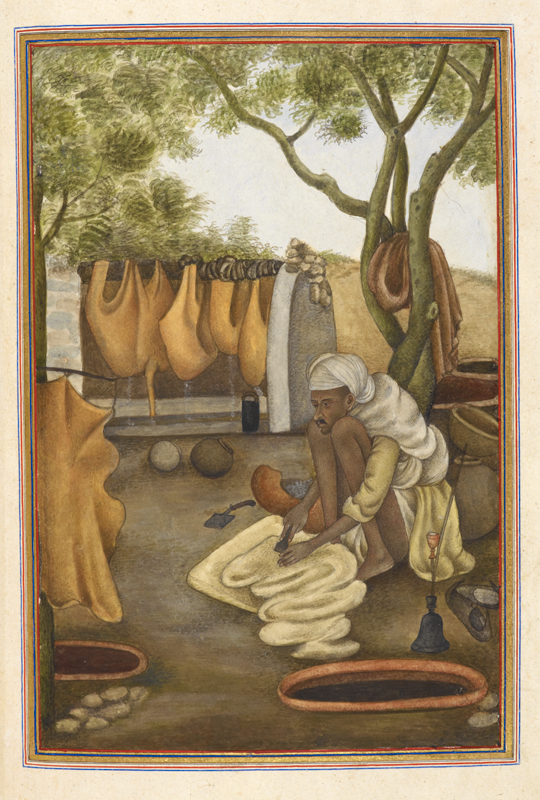 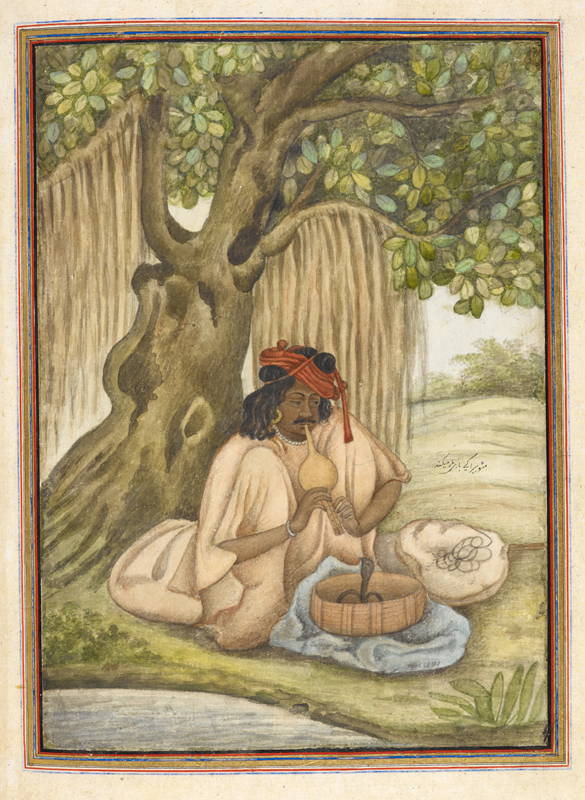 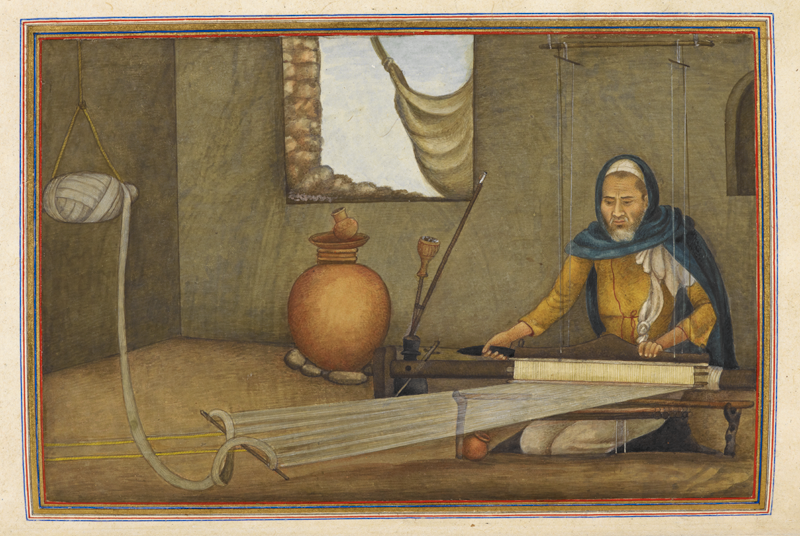 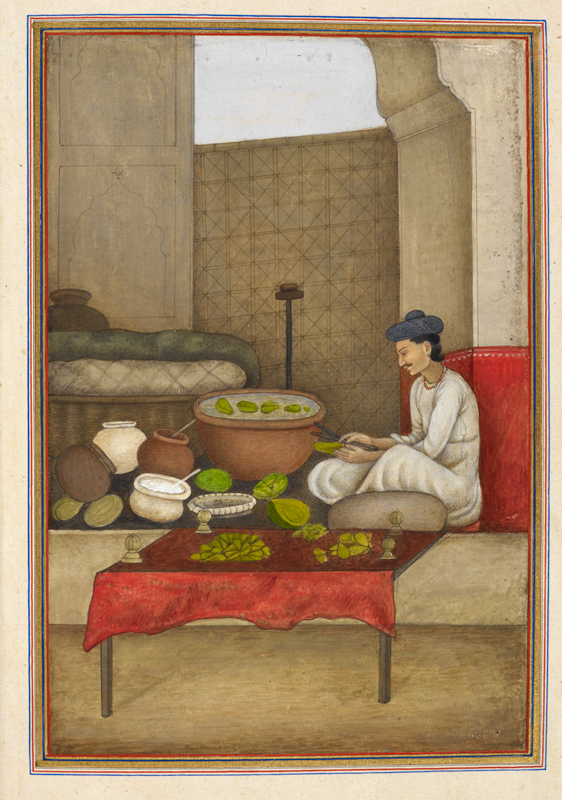 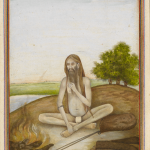 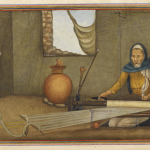 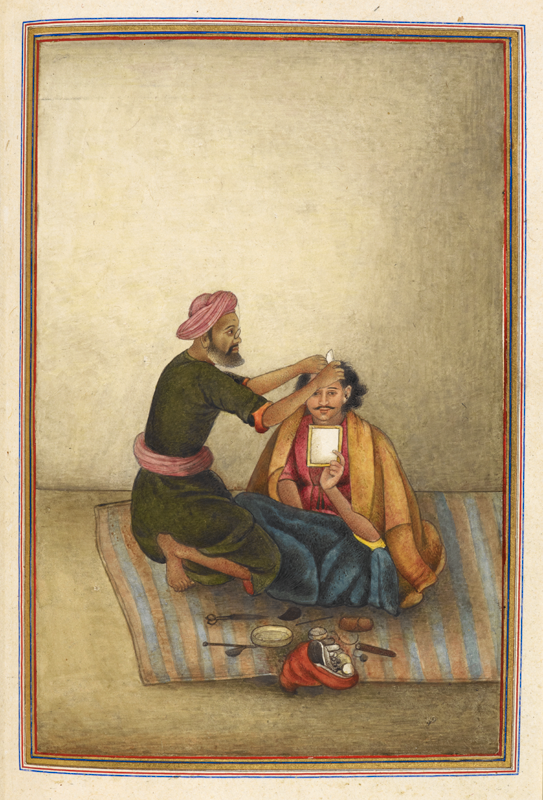 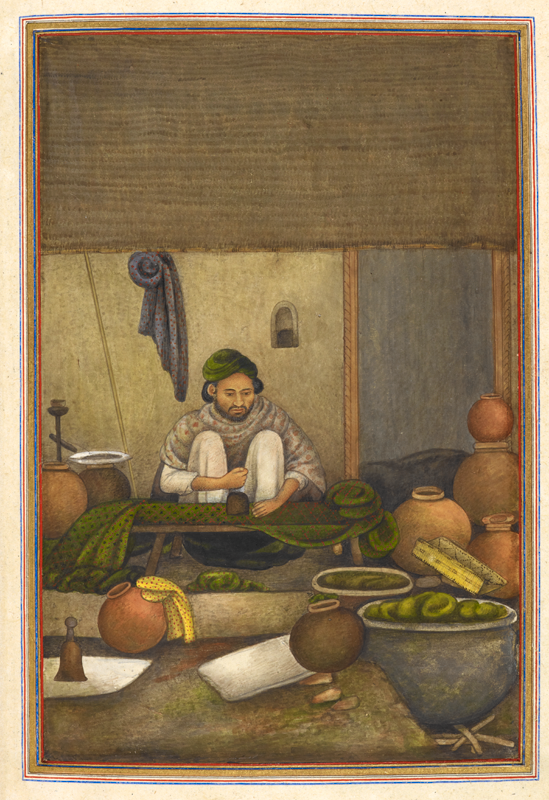 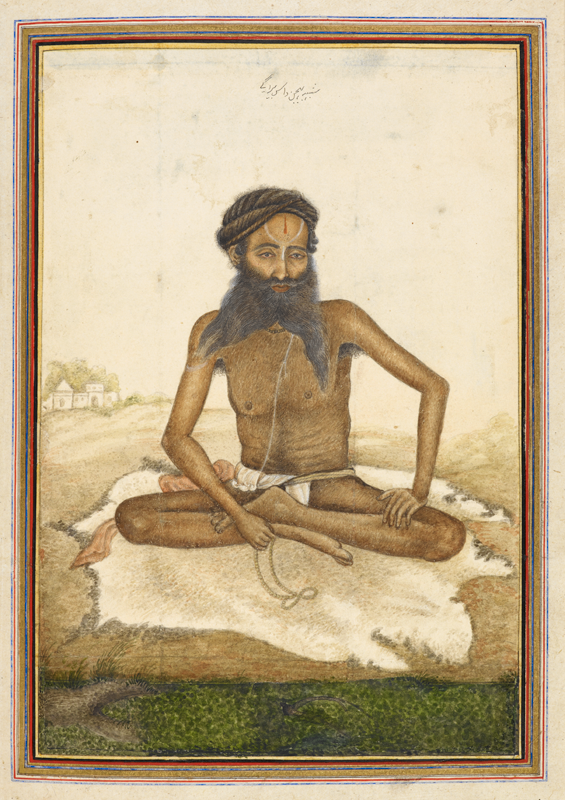 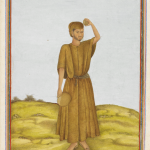 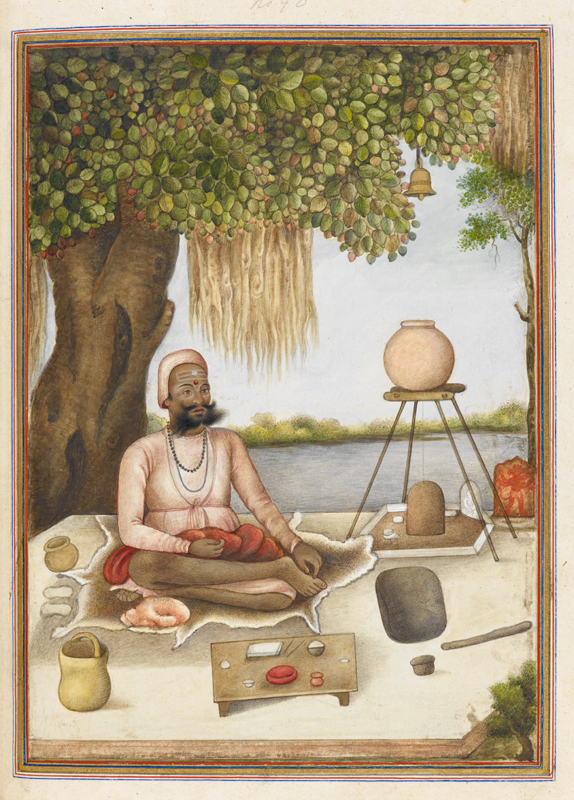 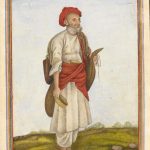 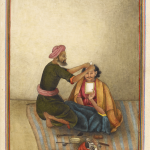 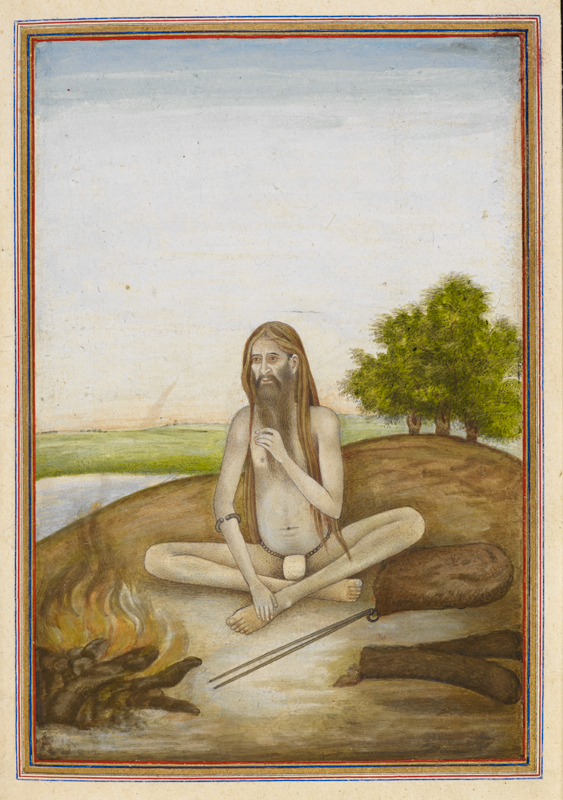 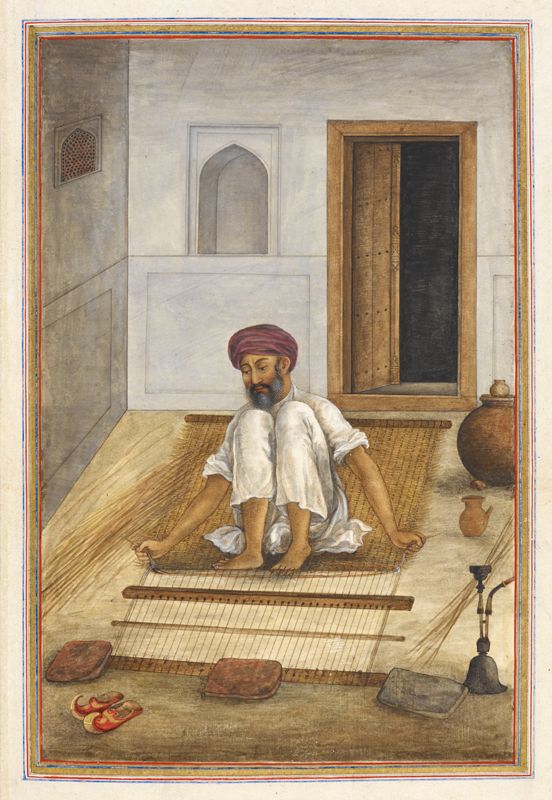 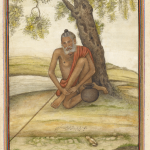 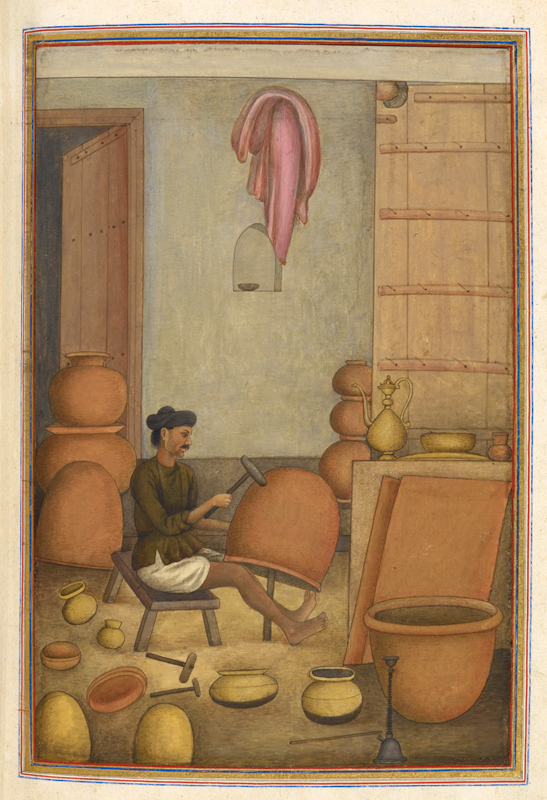 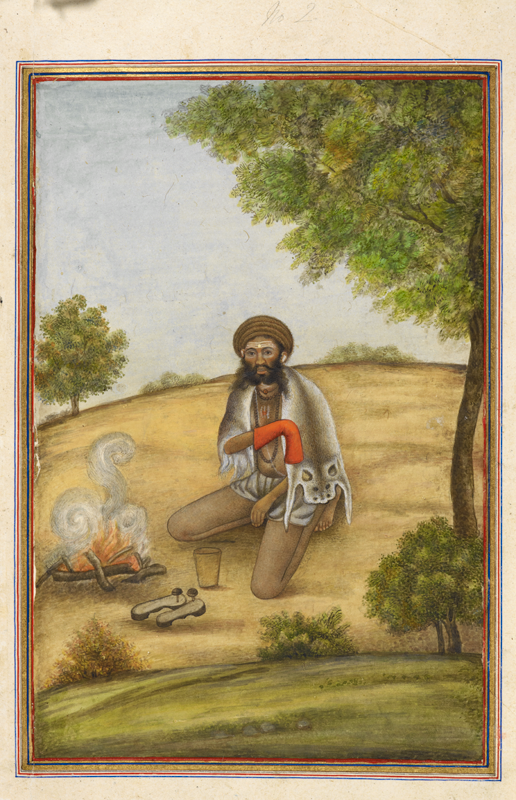 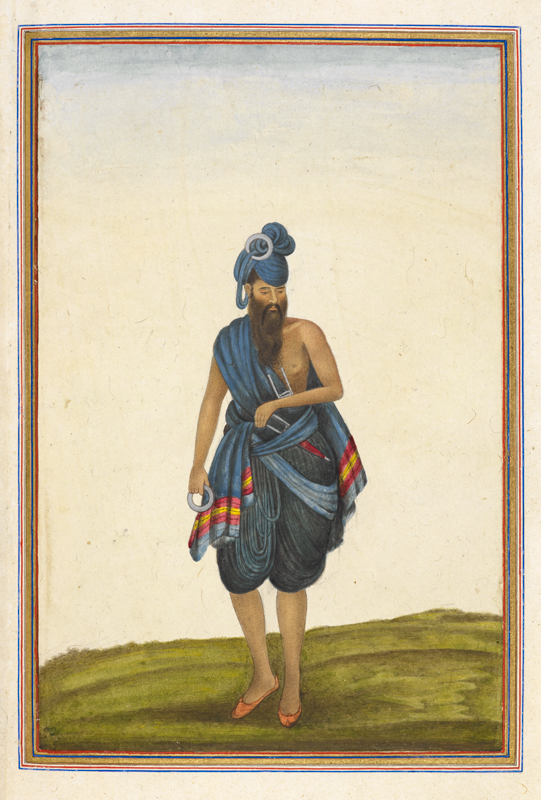 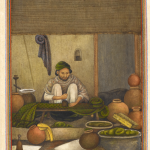 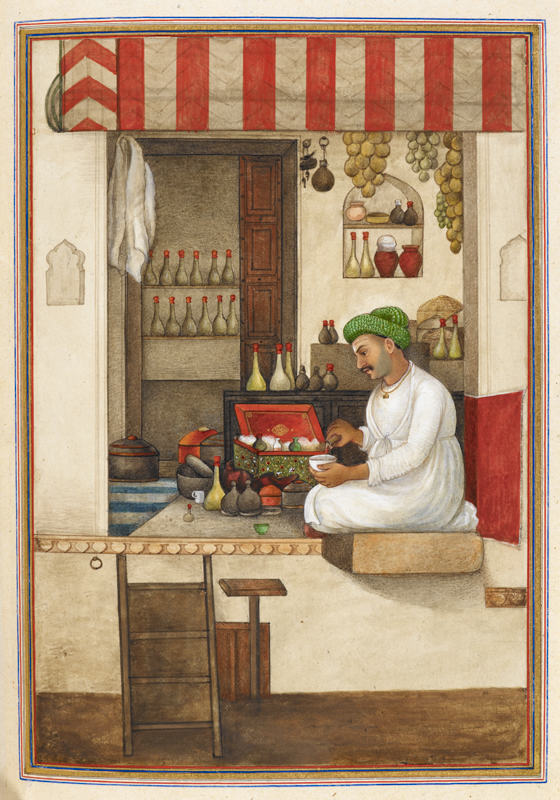 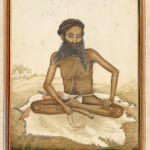 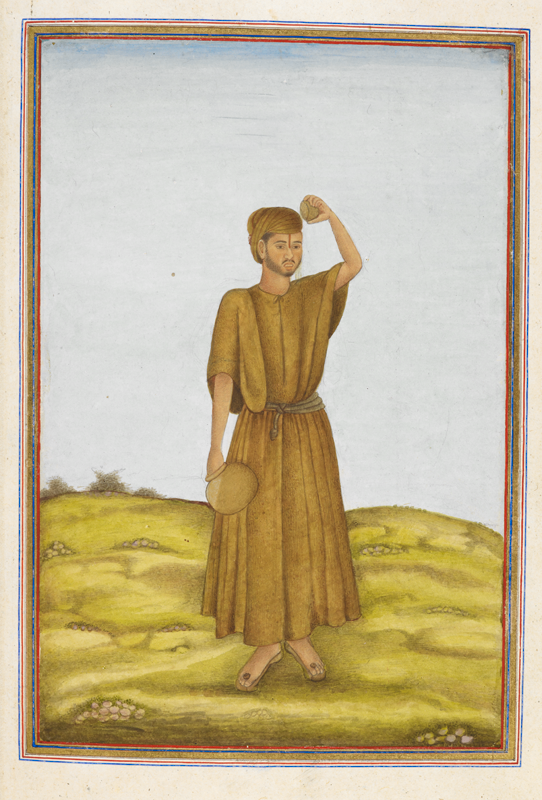 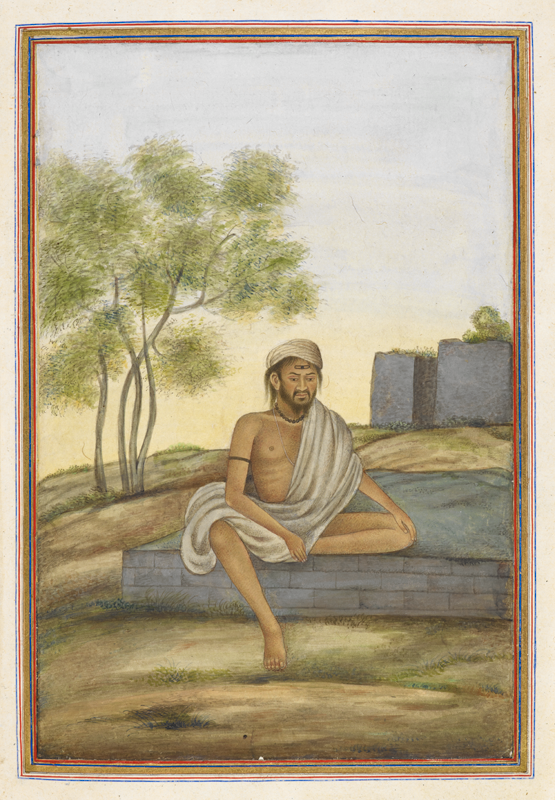 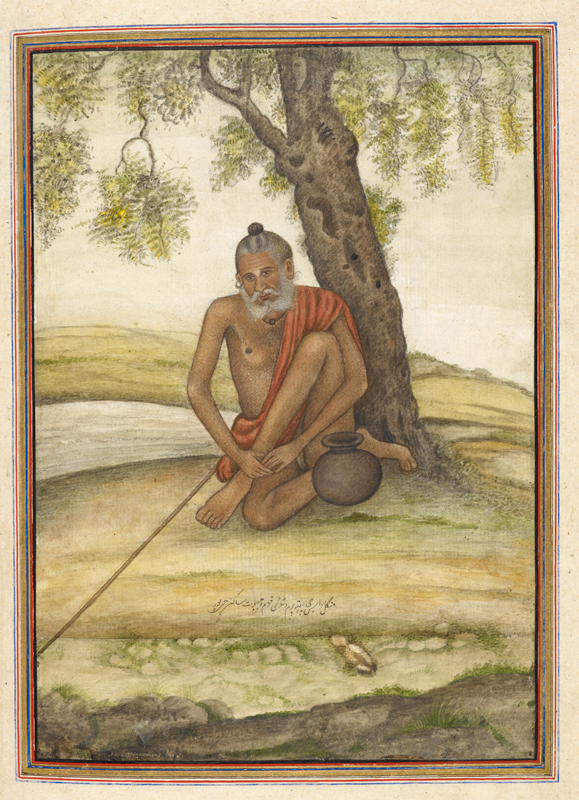 The artist accompanied Skinner on his travels, and the watercolor portraits in the British Library manuscript are likely studies from life.The portraits in the Tashrih al-aqvam, especially those of ascetics, are done in a realistic manner that reflects the ethnographic quality of the text. 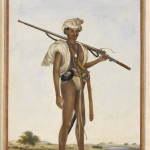 Some figures are named. 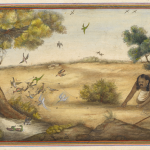 All of the paintings from the album may be viewed here.